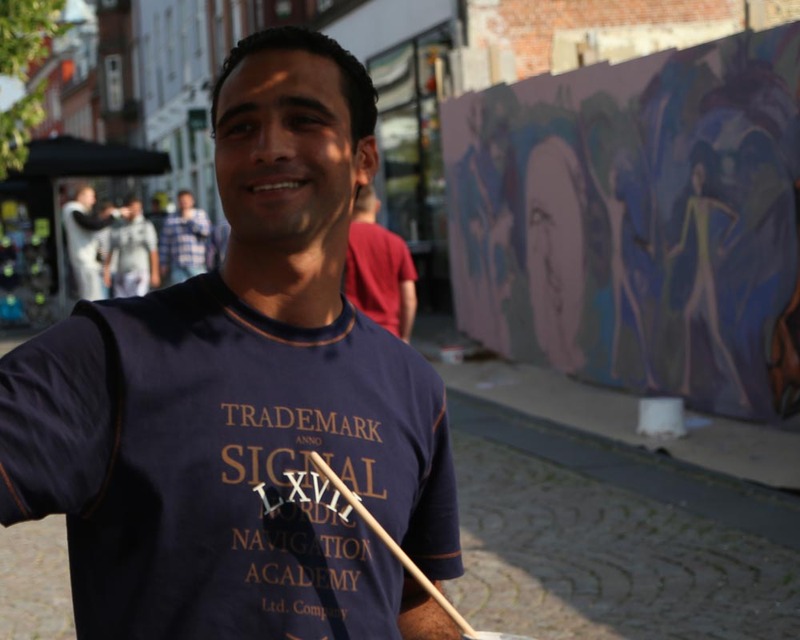 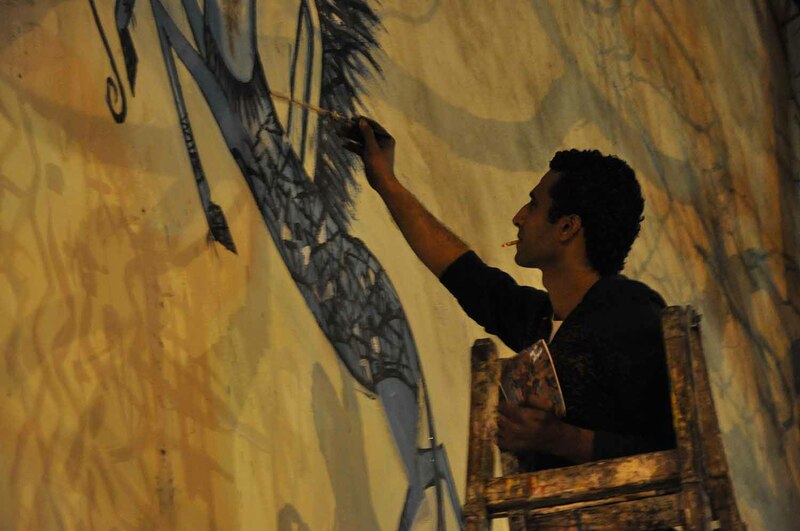 Unlike other graffiti artists, Alaa Awad chooses to paint with a brush and uses acrylic paints rather than using stencils and spray paints. 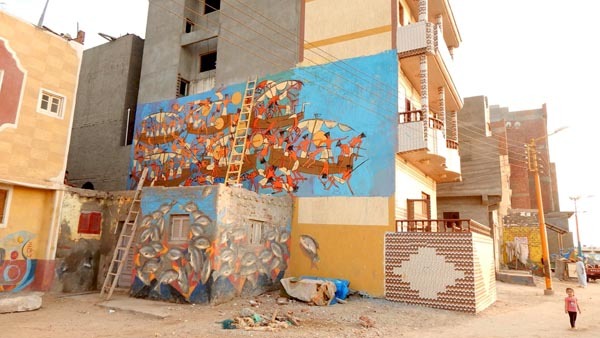 His intricate murals can sometimes take up to a week to make not only because of the materials he uses, but because of the complexity of his designs. 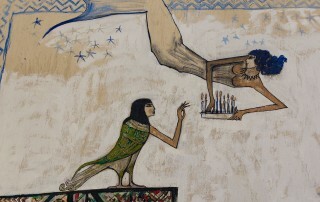 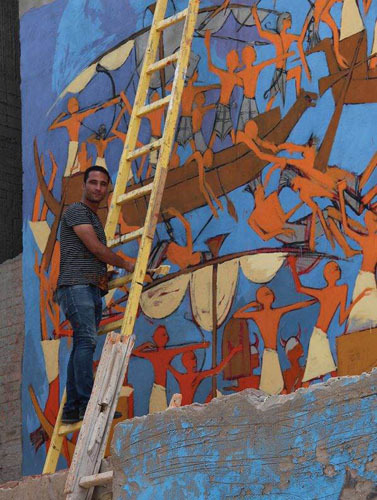 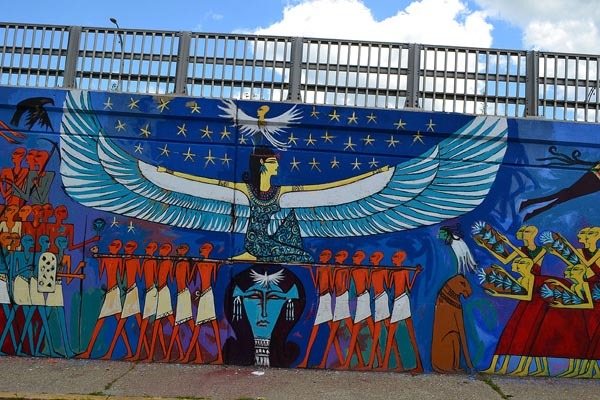 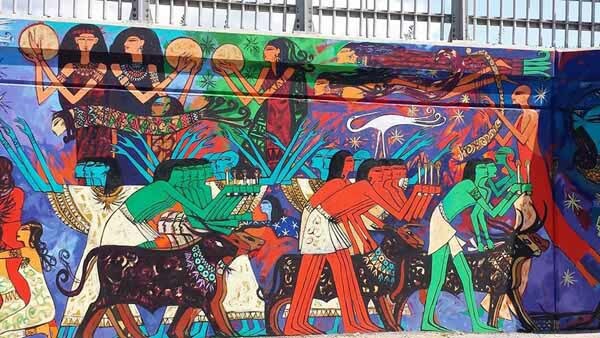 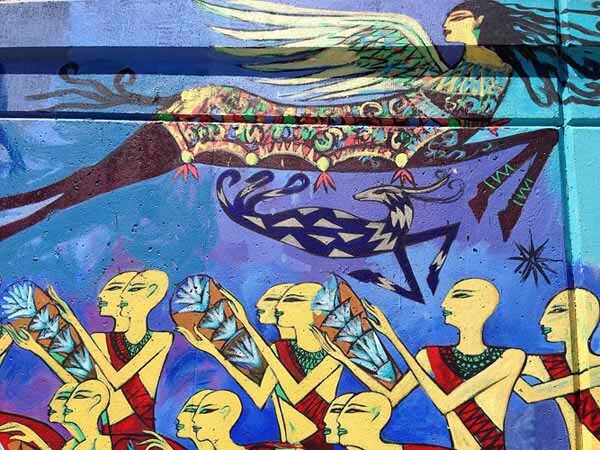 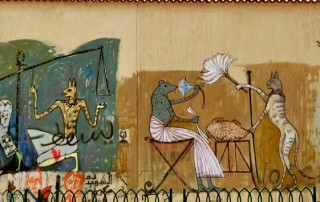 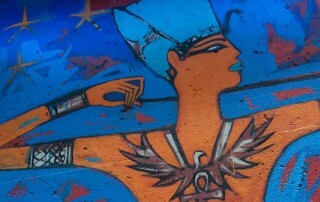 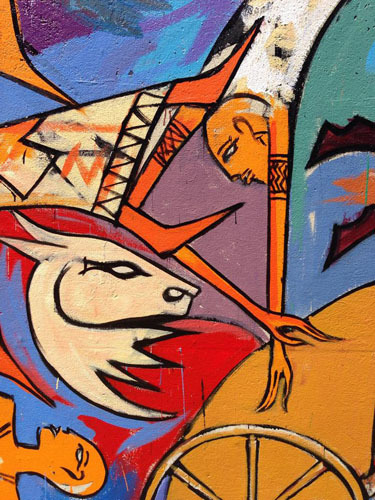 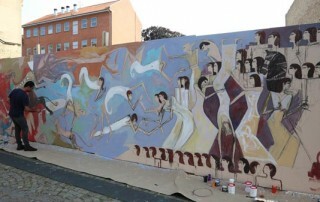 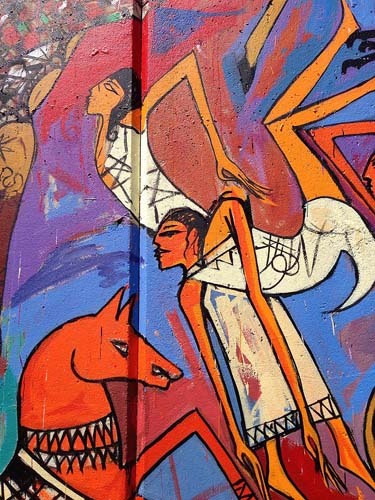 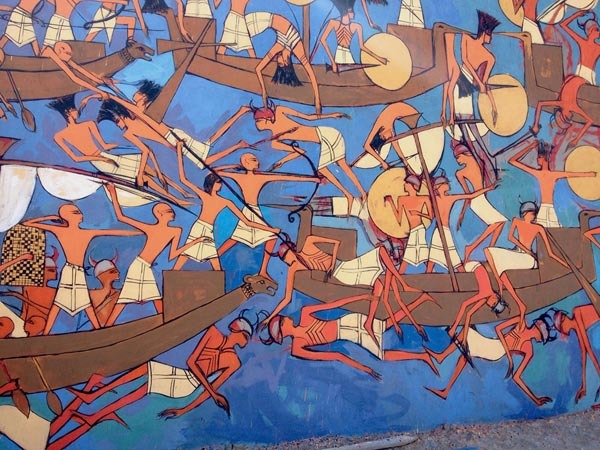 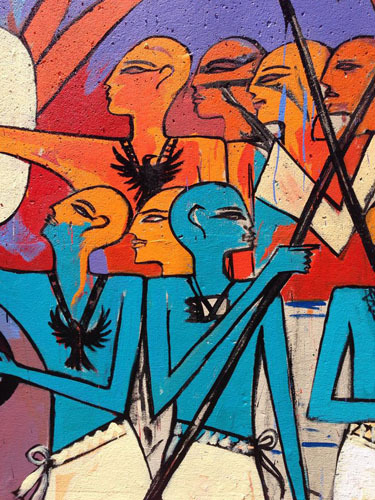 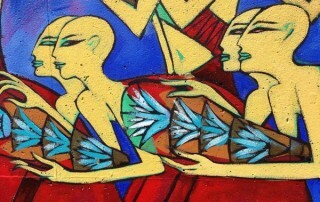 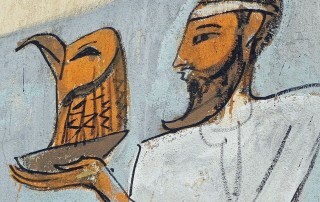 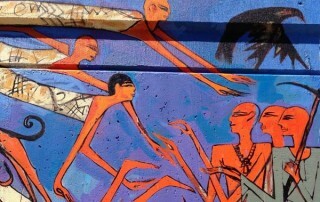 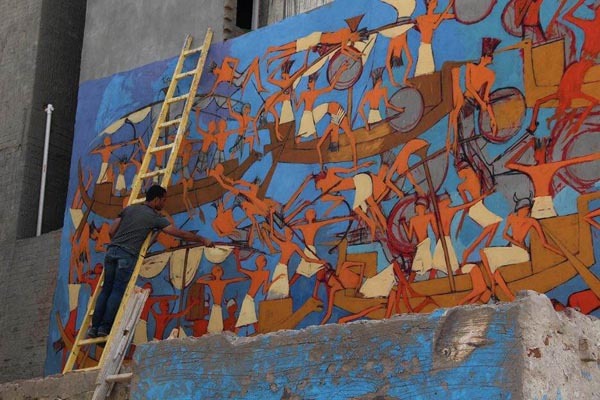 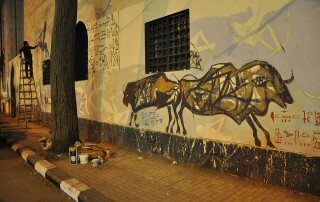 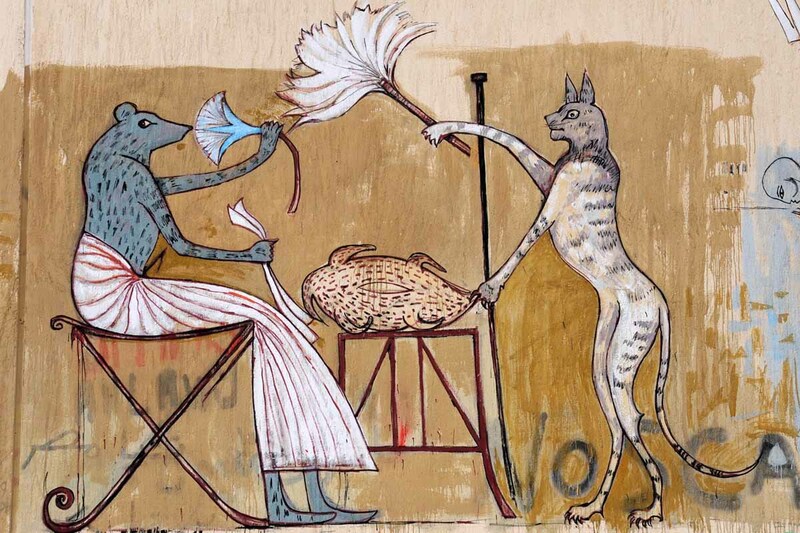 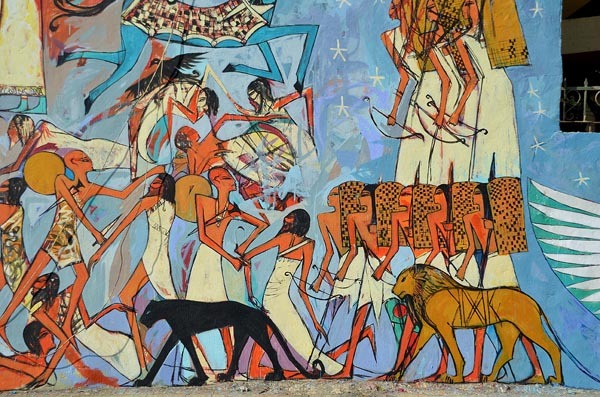 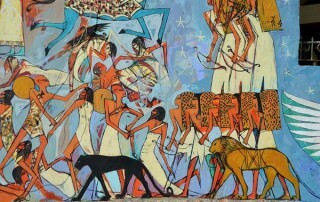 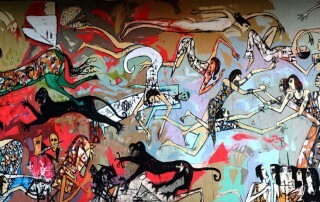 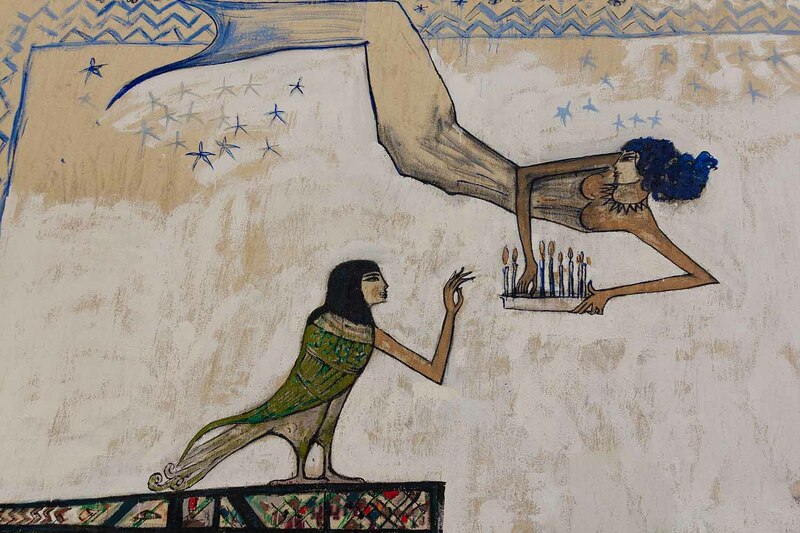 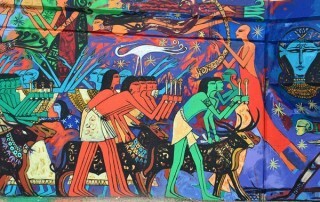 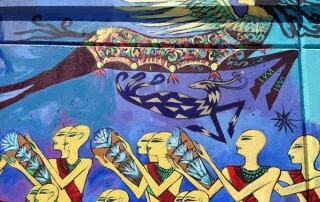 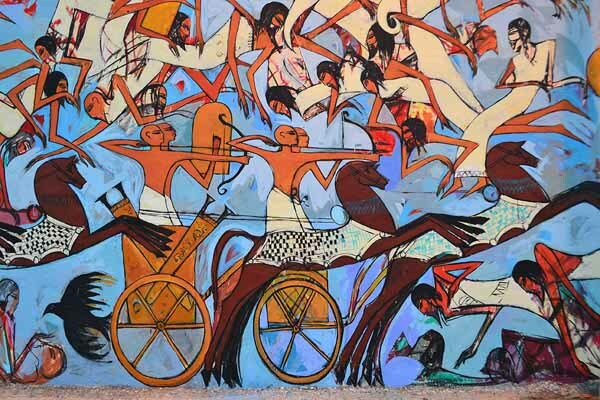 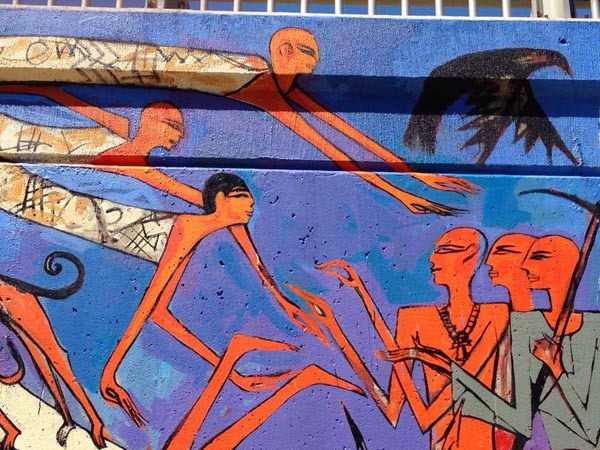 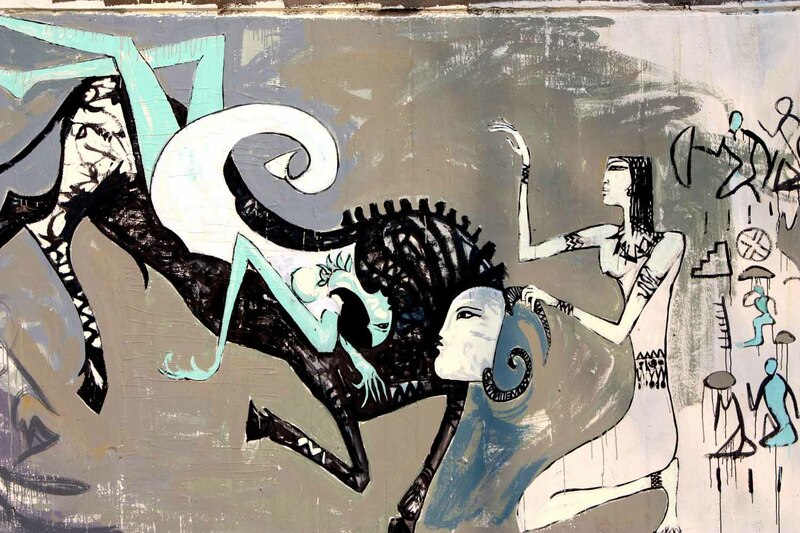 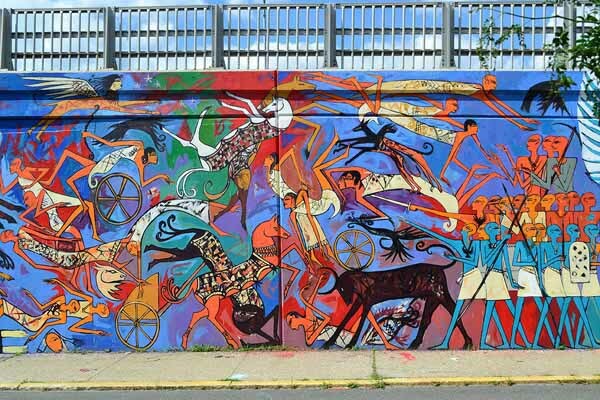 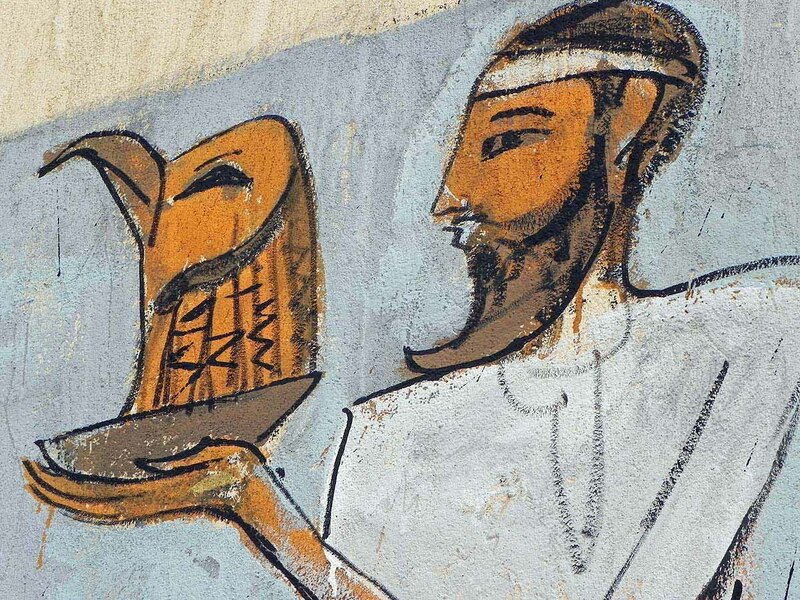 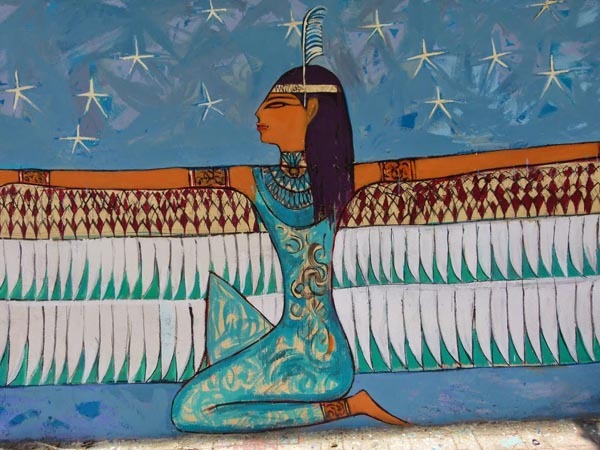 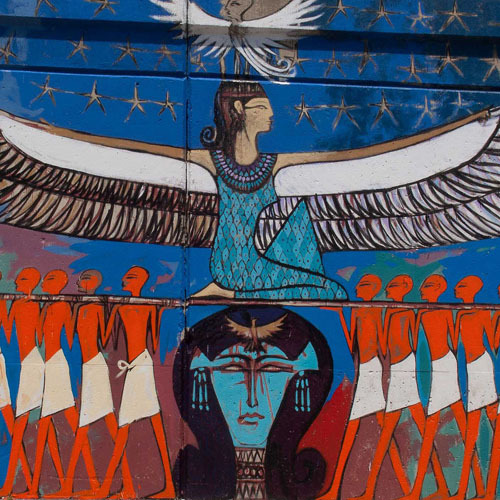 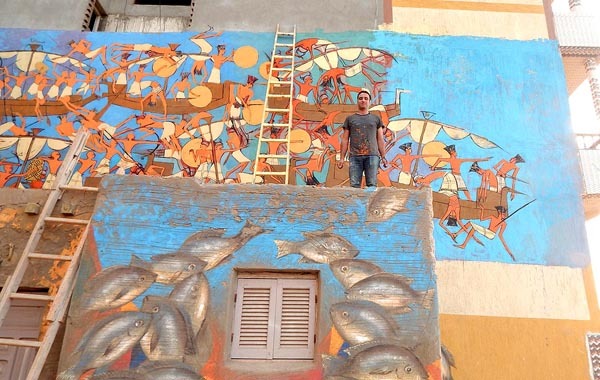 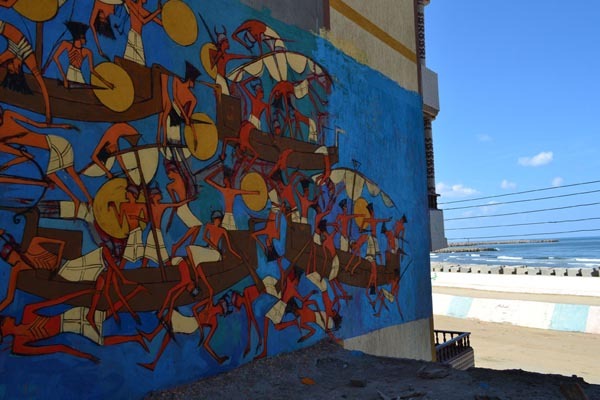 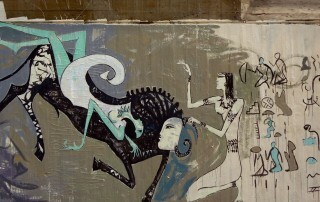 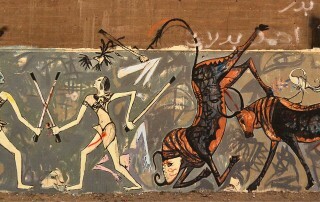 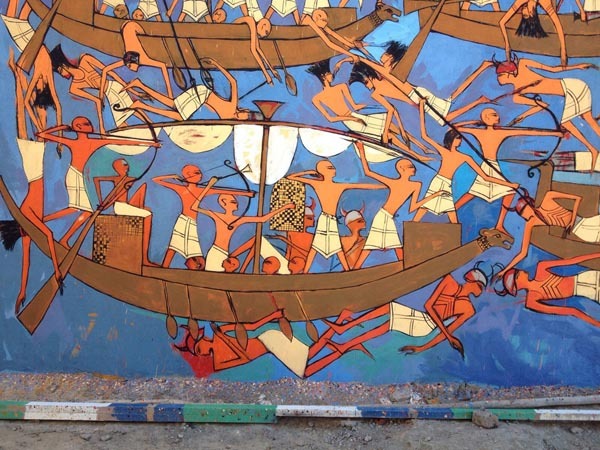 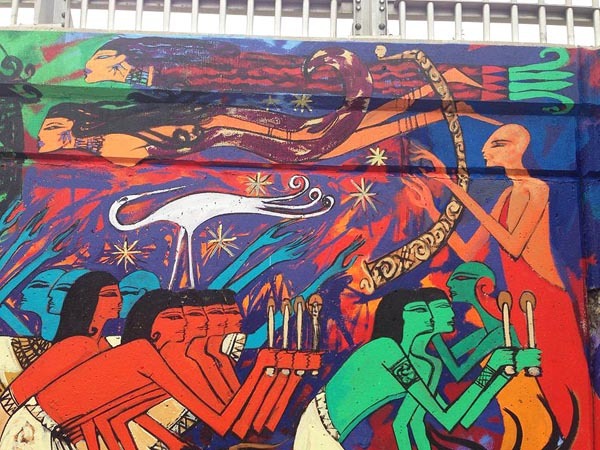 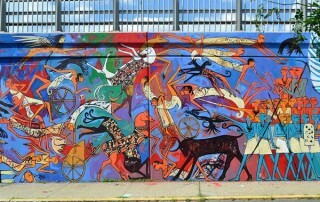 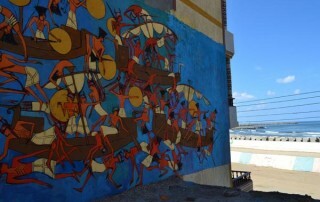 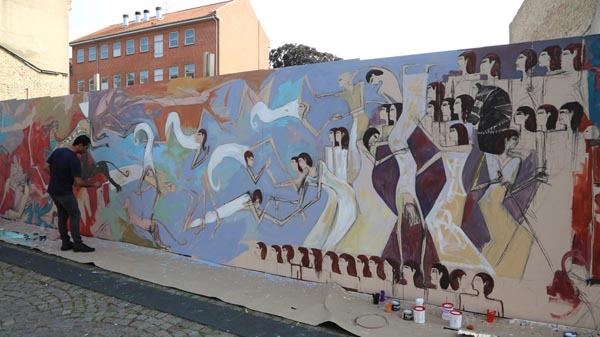 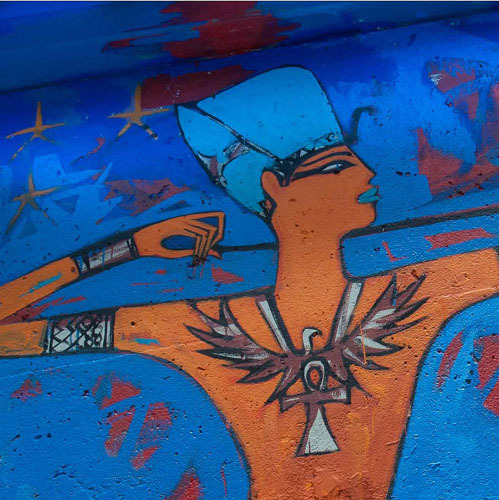 Awad paints in a neo-pharonic graffiti style, a style that harkens back to Ancient Egypt. 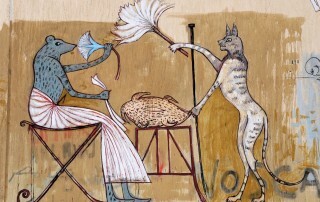 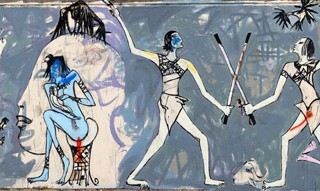 His usage of the neo-pharonic style is meant to draw attention back to rich, old Egyptian traditions. 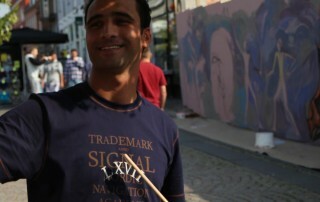 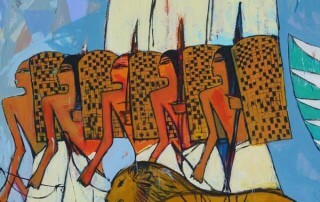 This style aims to remind protestors of their heritage and past to help them stay true to their Egyptian identity. 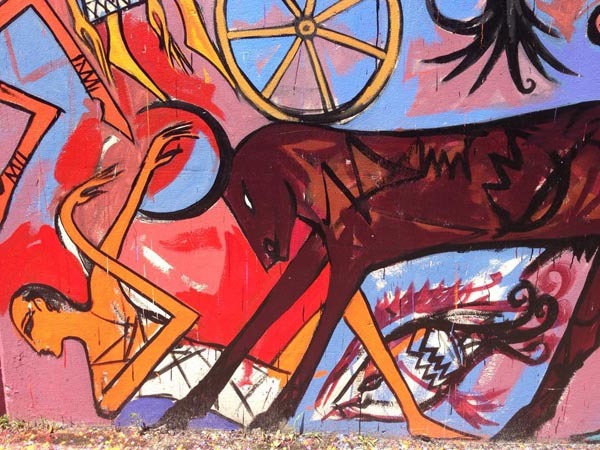 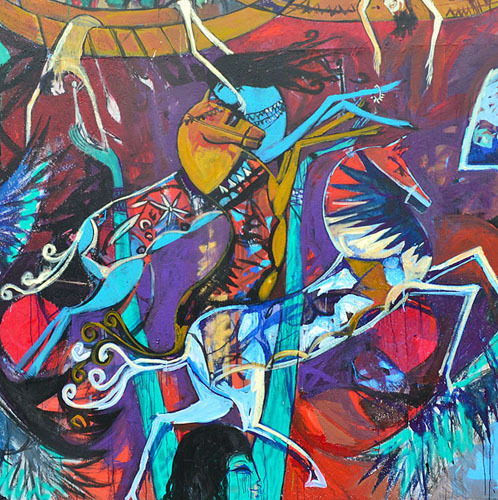 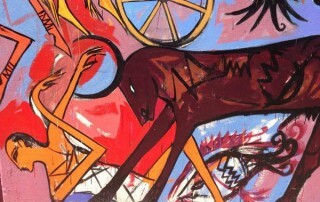 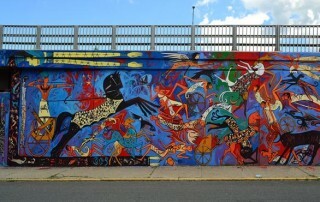 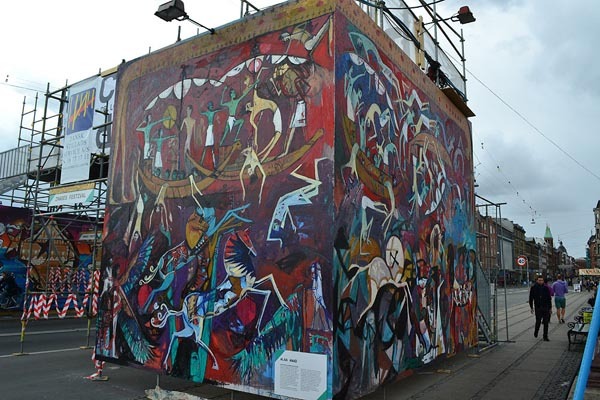 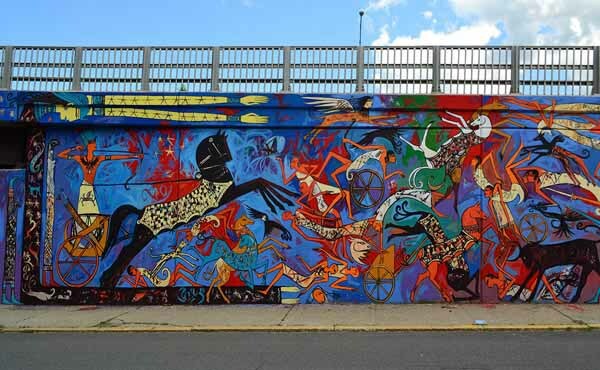 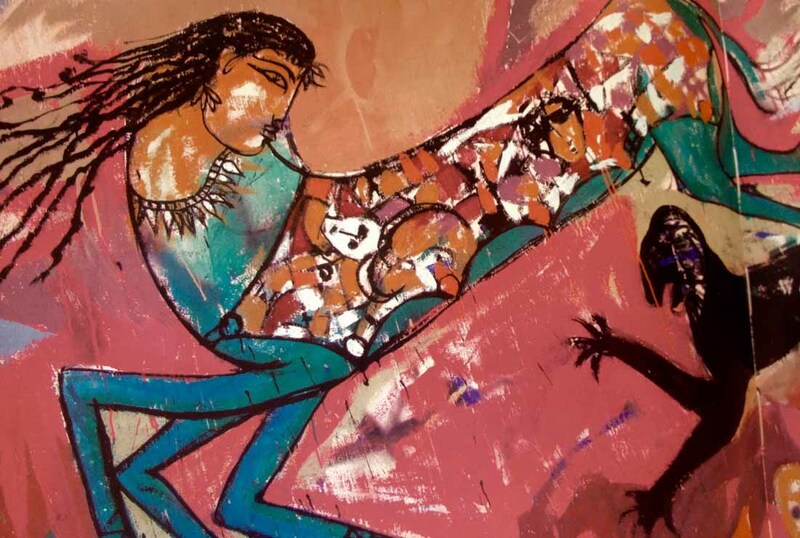 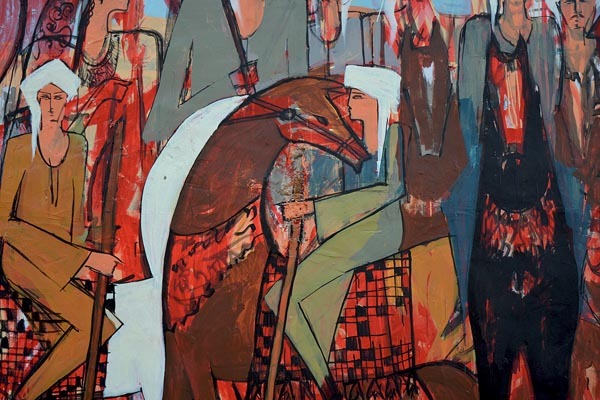 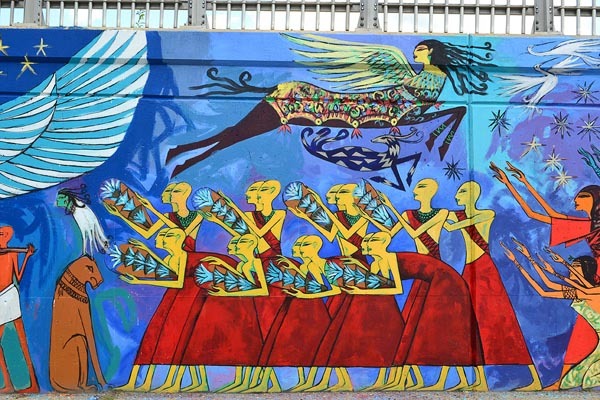 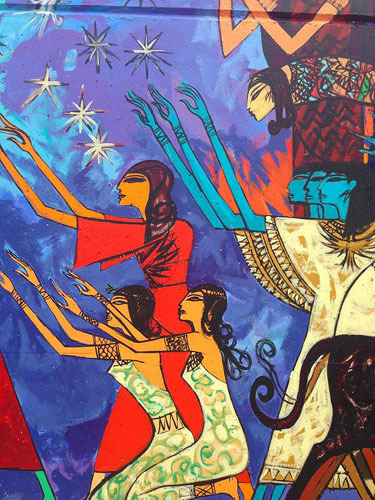 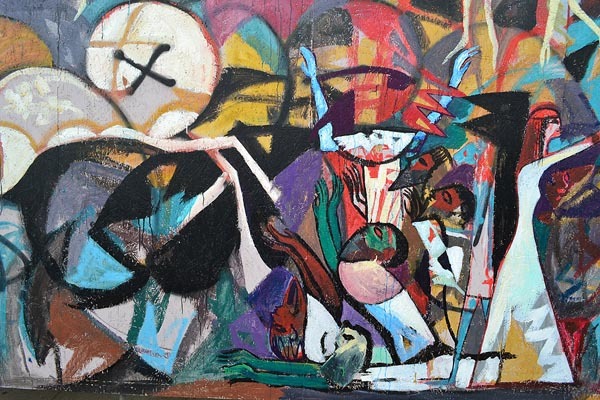 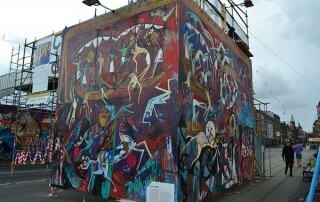 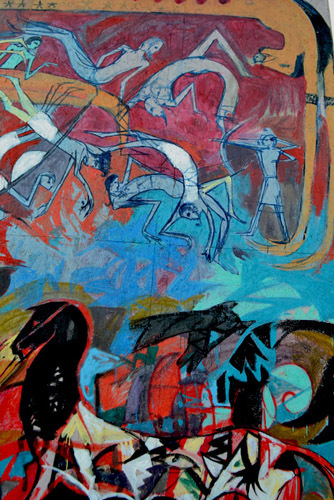 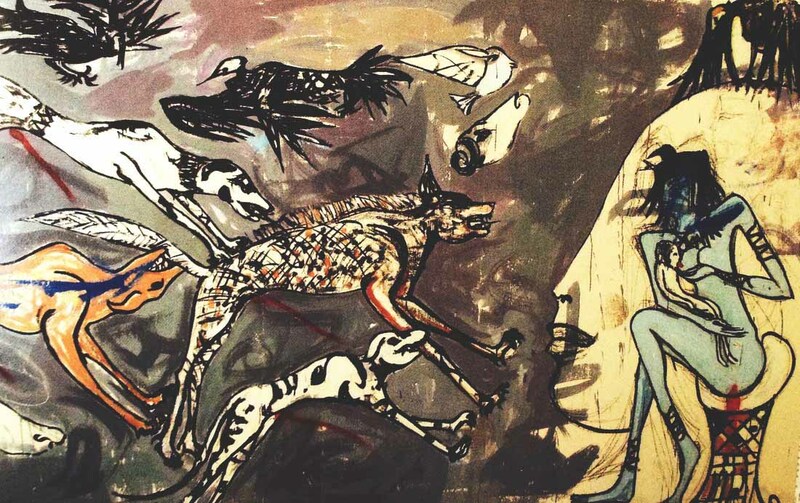 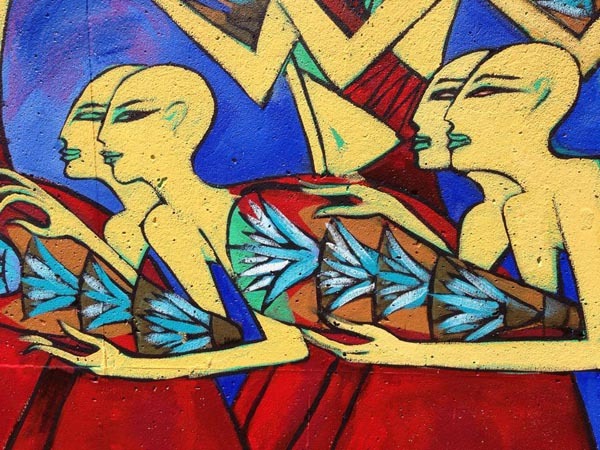 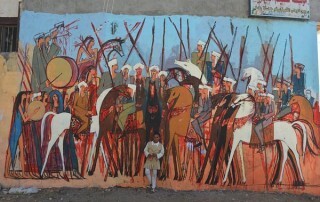 His murals are typically multifaceted and multi-layered with each telling a different story. 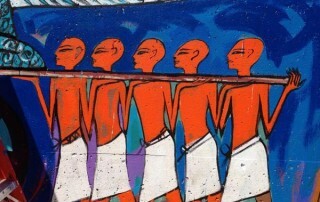 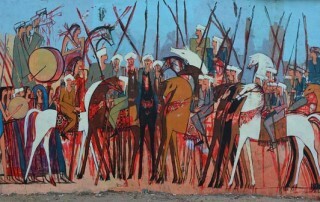 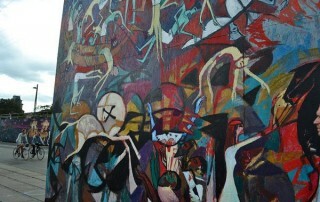 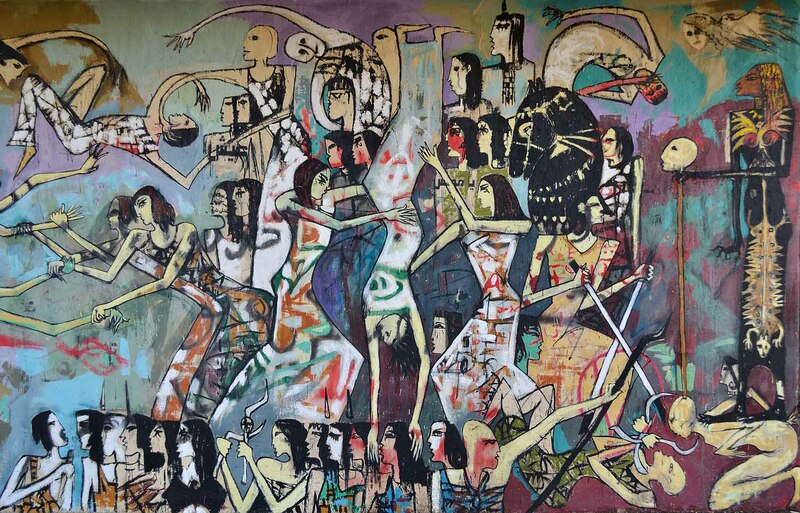 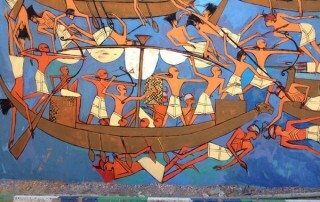 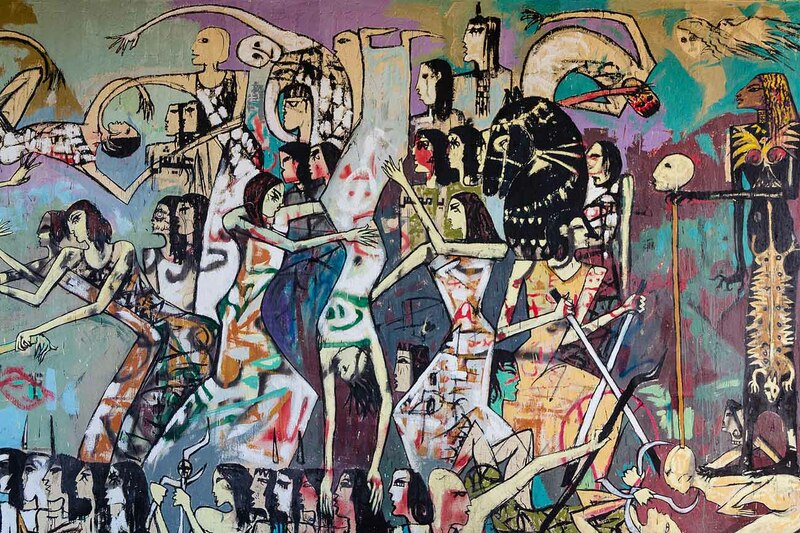 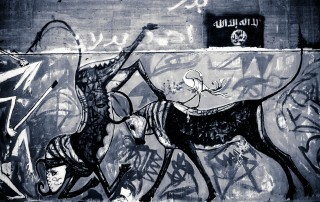 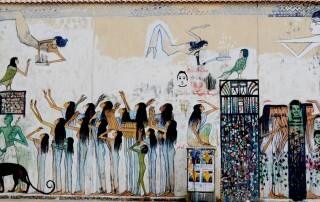 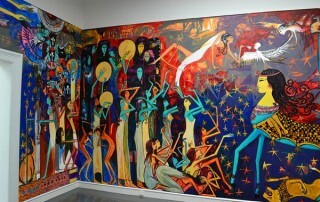 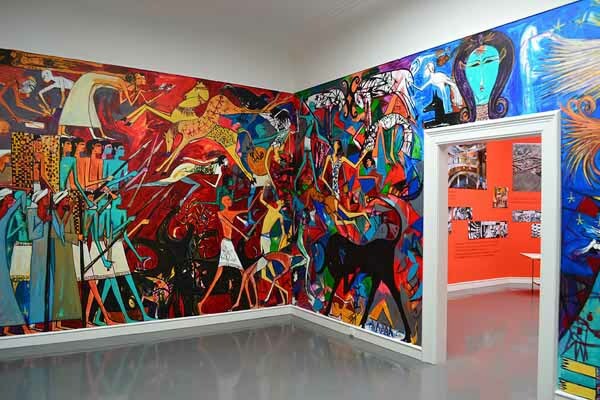 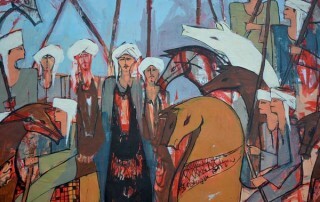 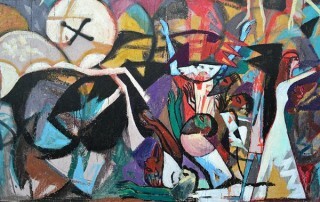 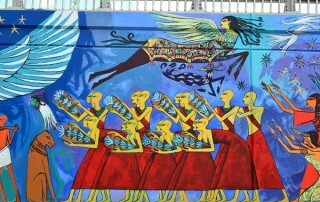 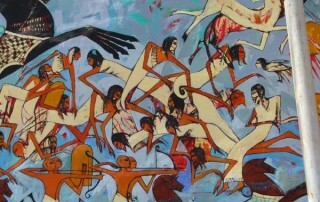 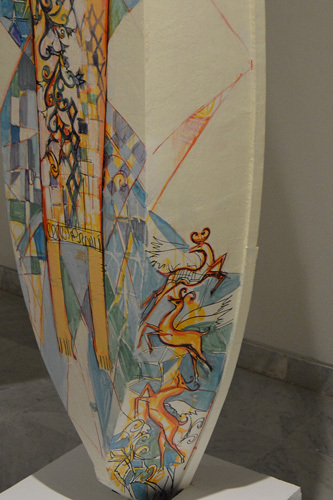 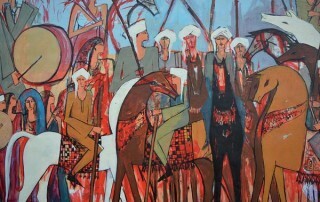 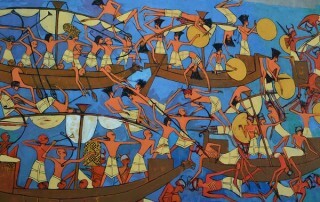 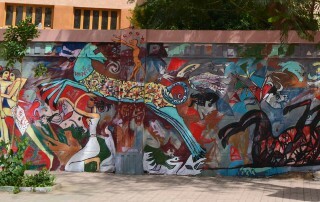 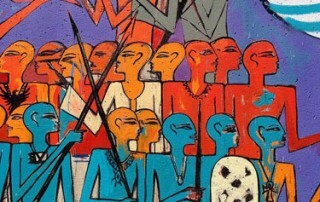 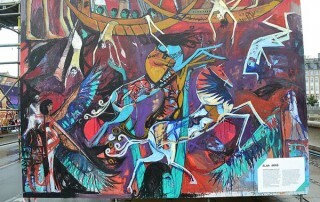 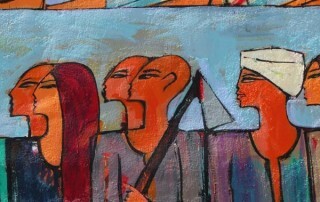 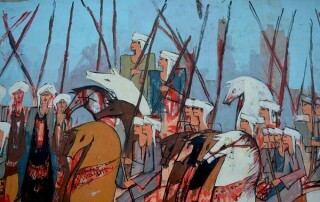 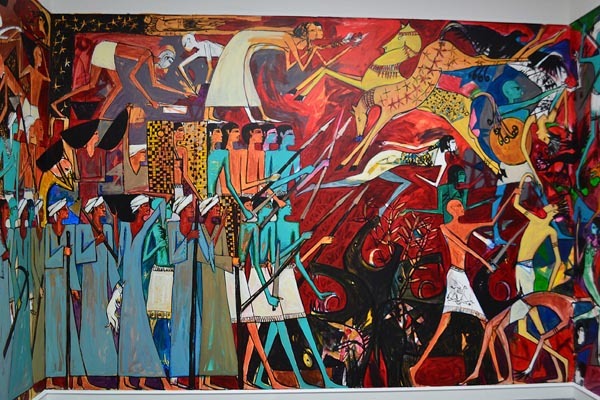 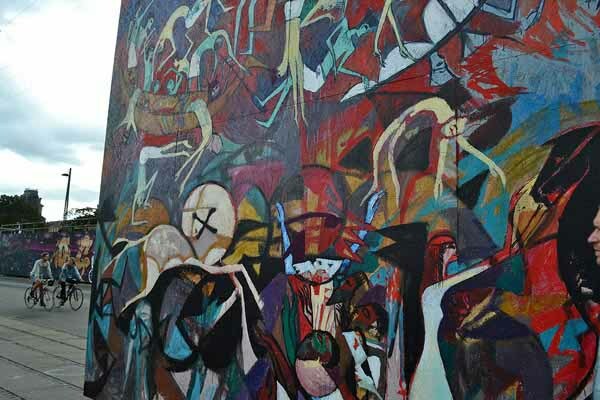 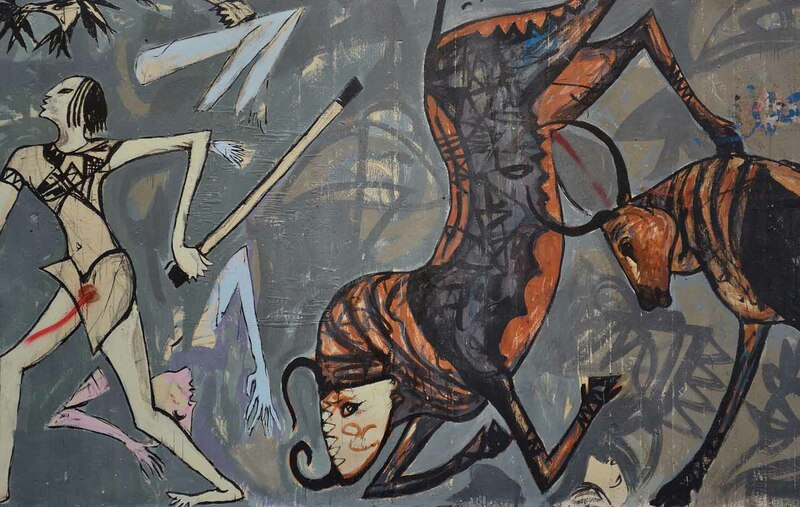 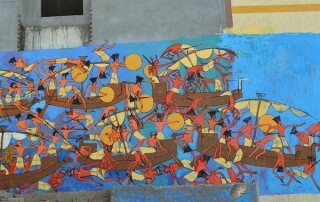 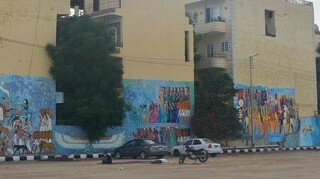 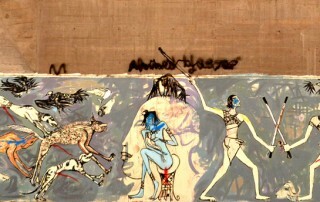 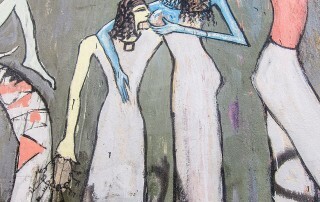 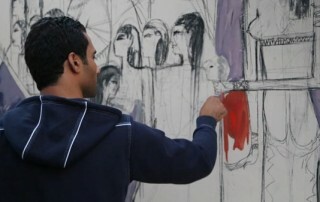 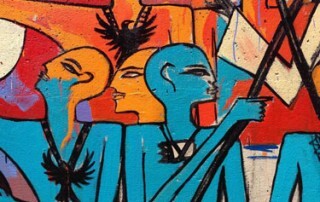 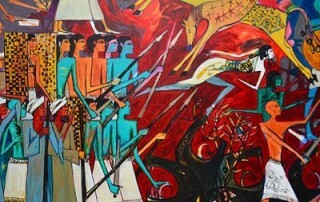 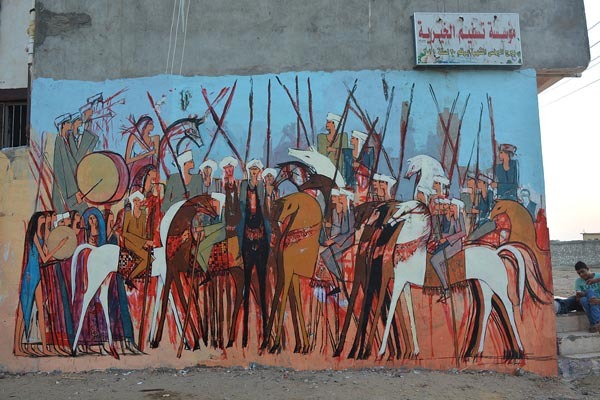 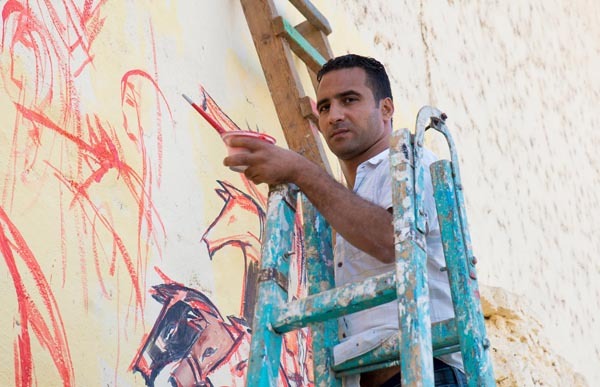 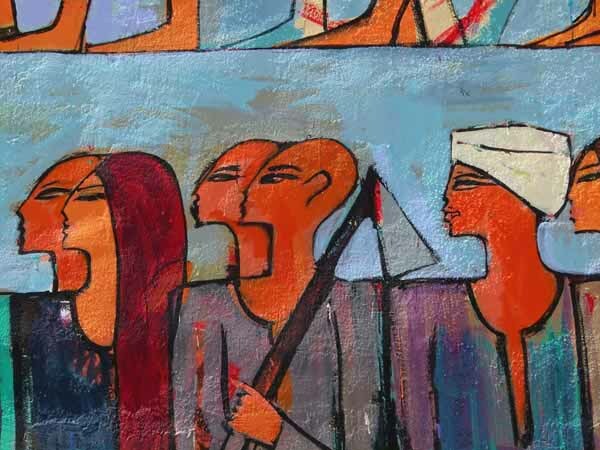 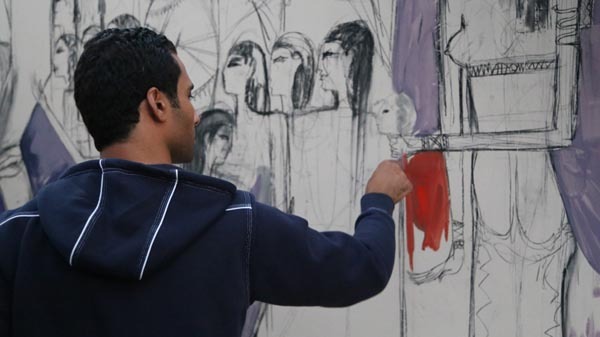 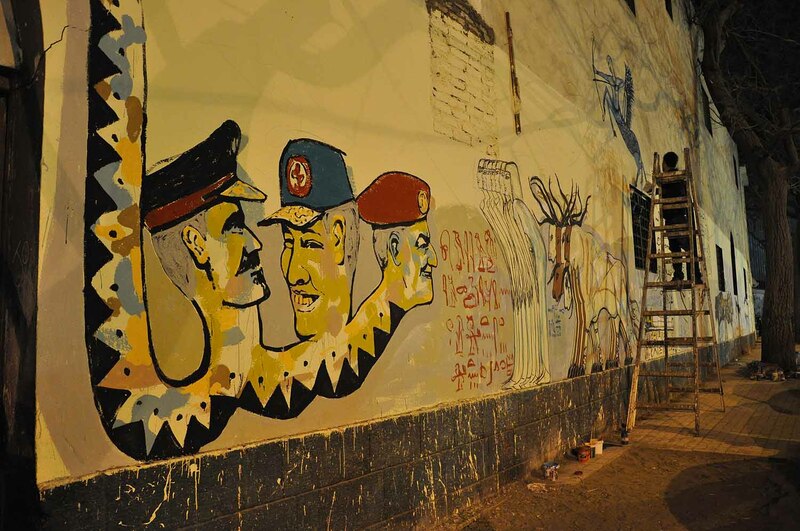 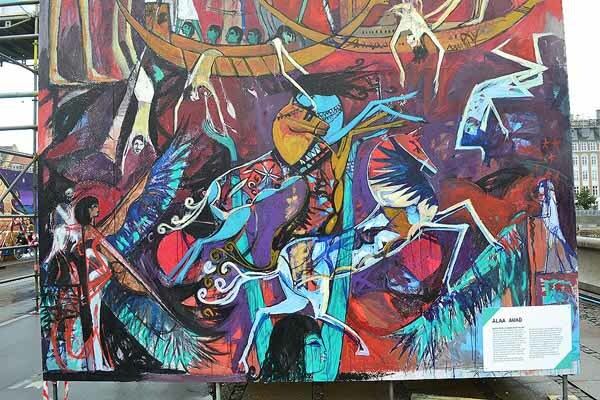 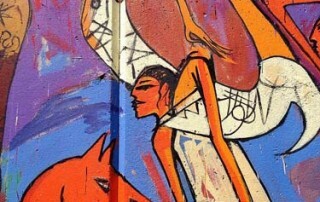 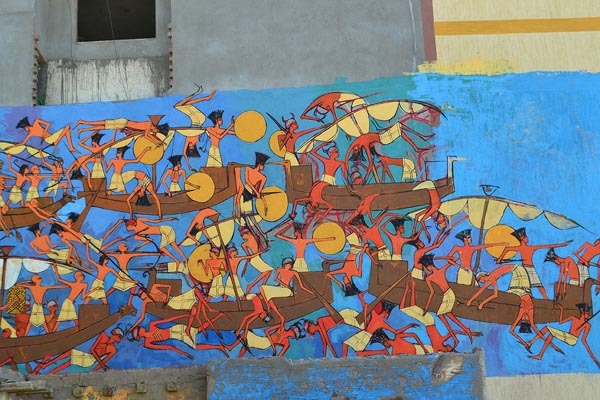 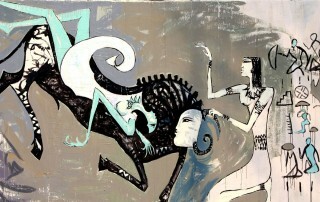 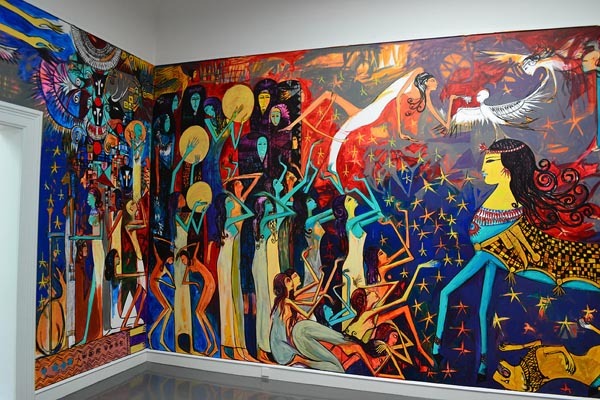 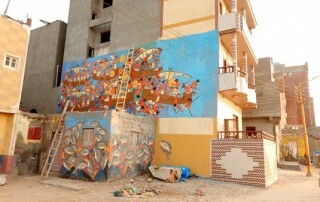 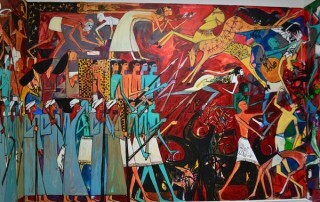 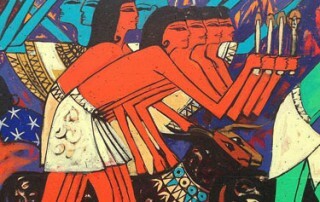 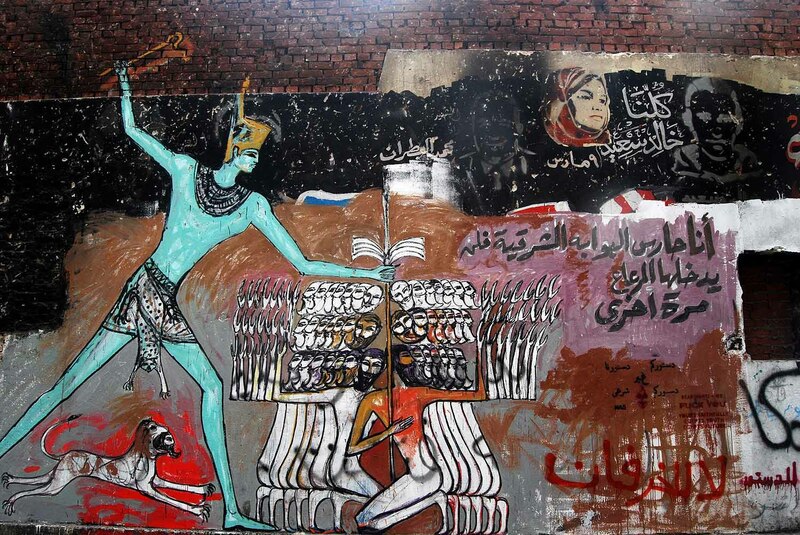 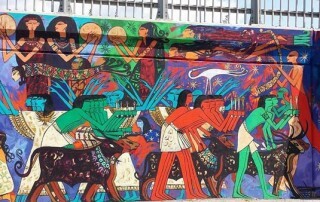 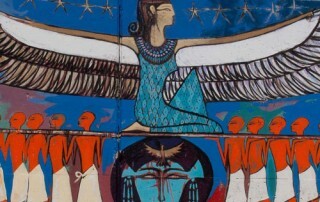 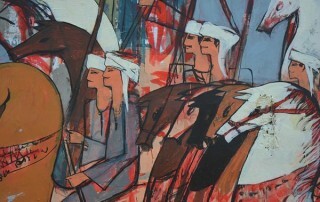 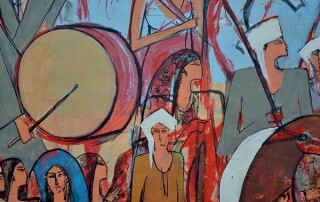 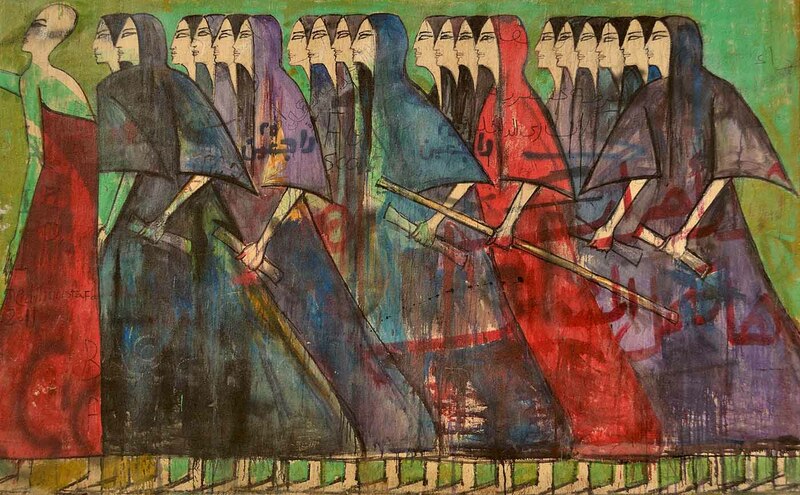 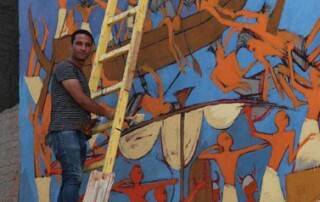 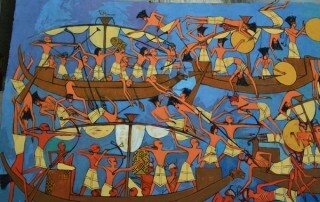 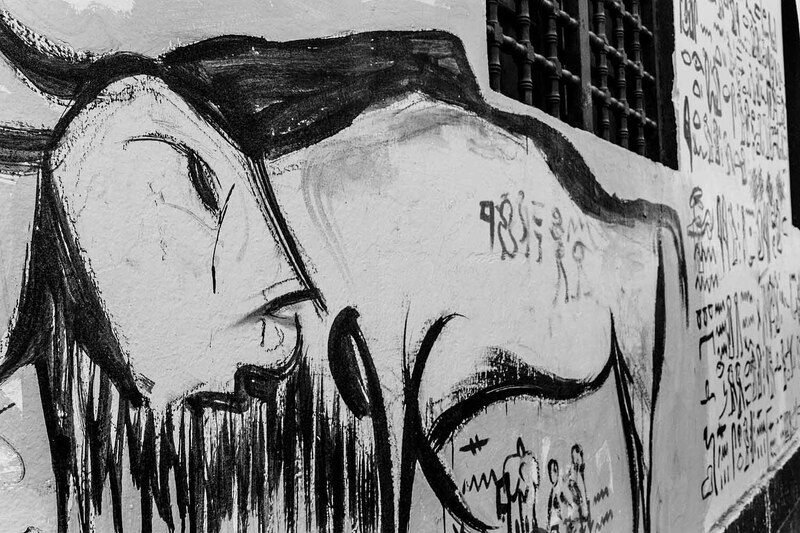 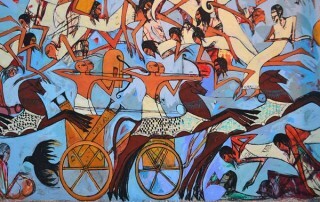 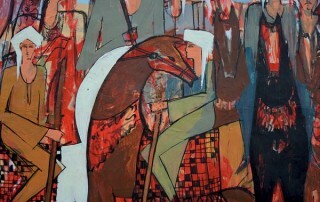 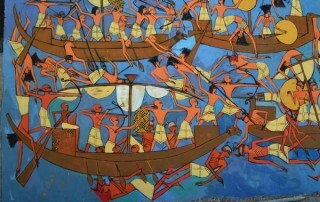 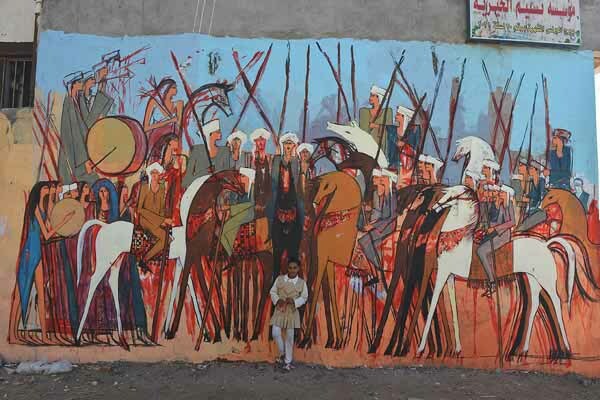 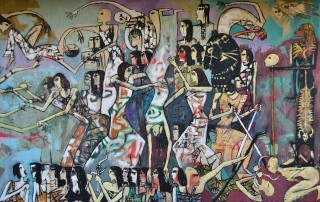 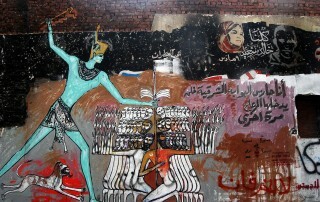 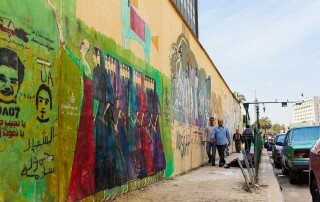 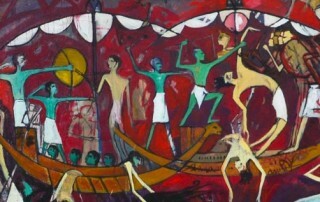 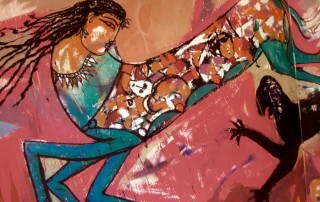 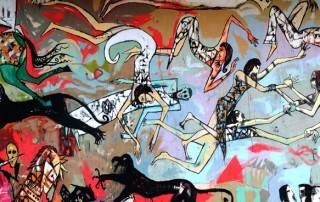 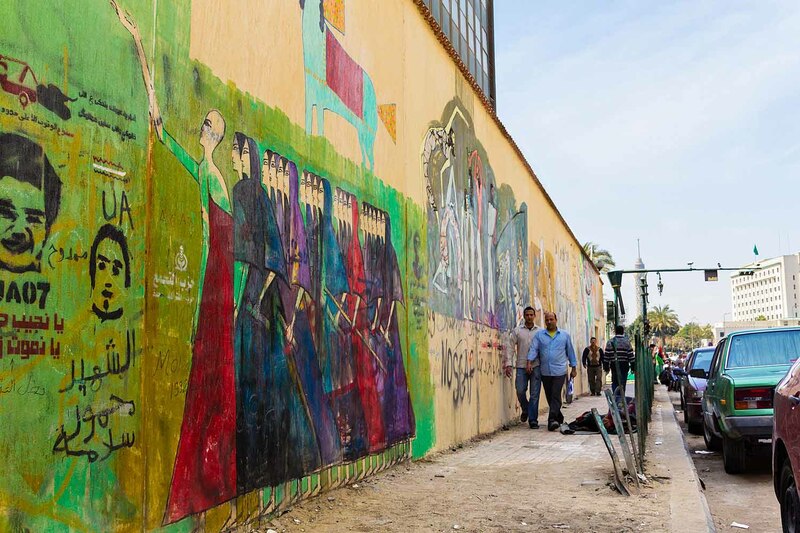 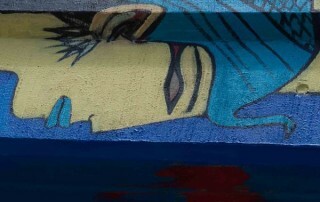 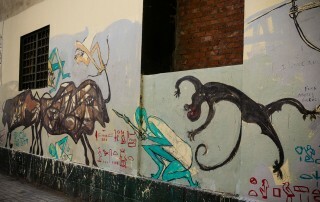 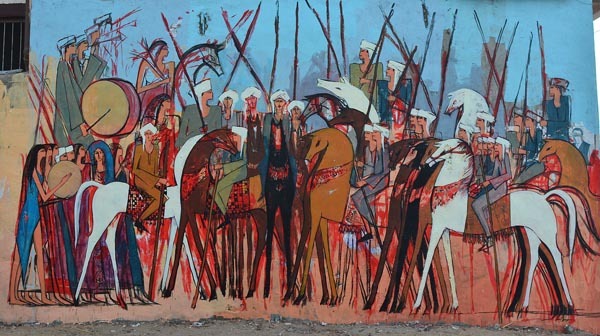 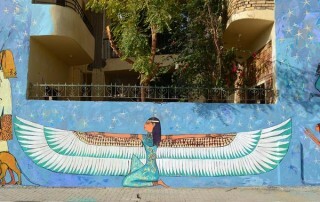 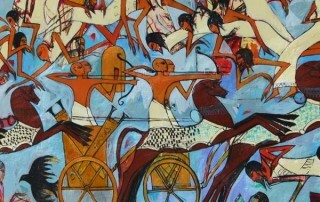 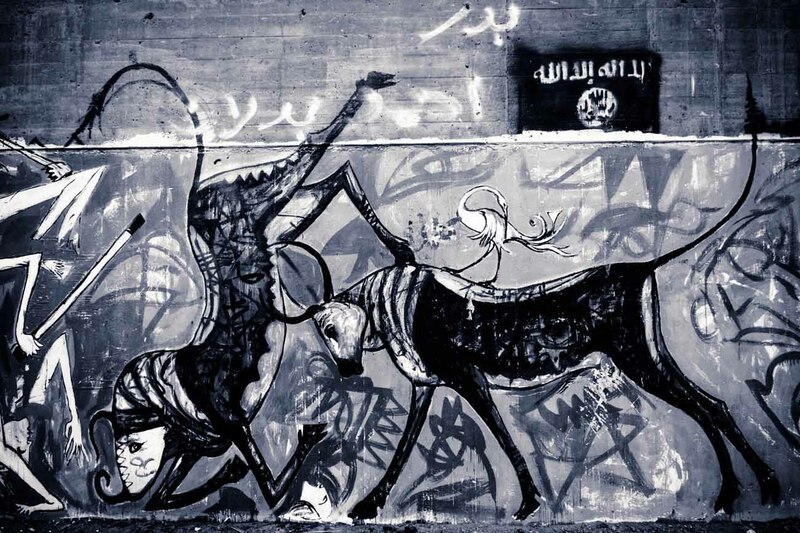 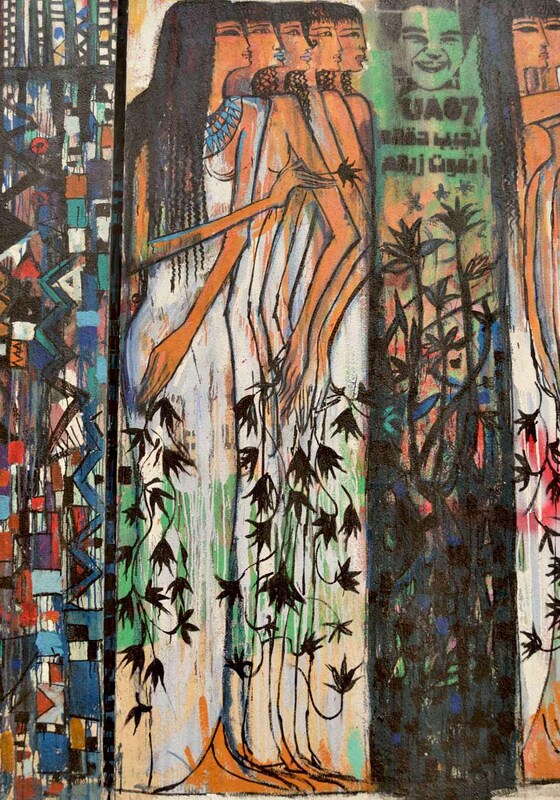 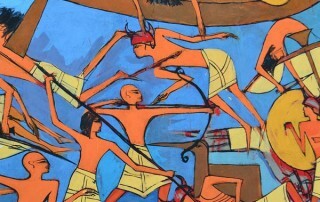 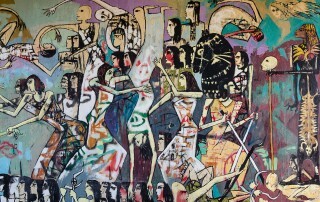 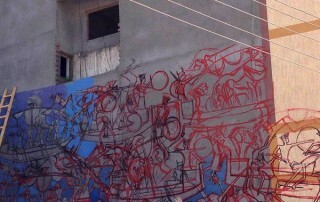 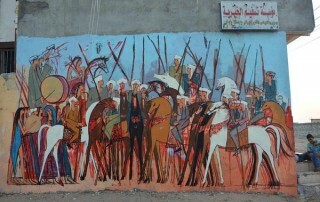 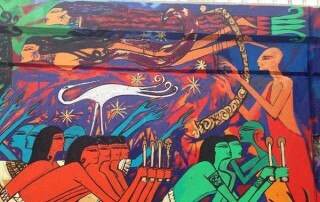 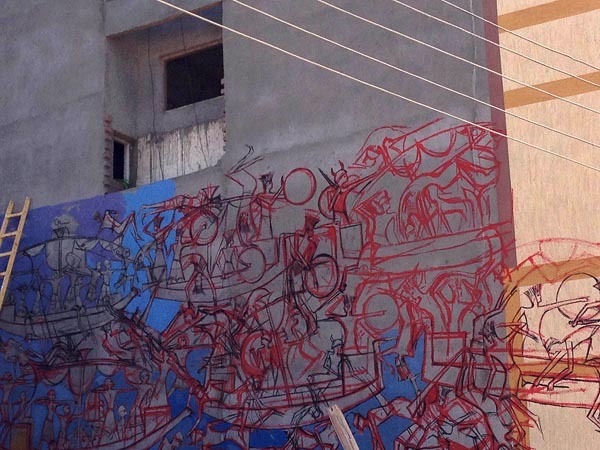 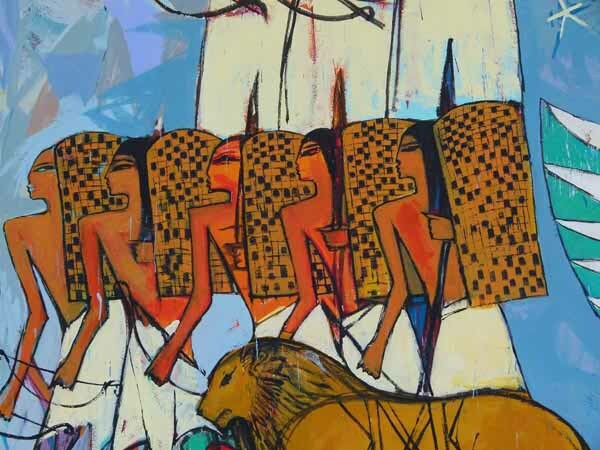 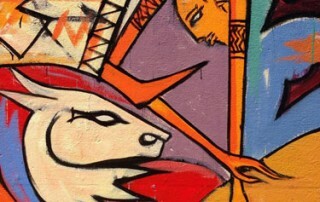 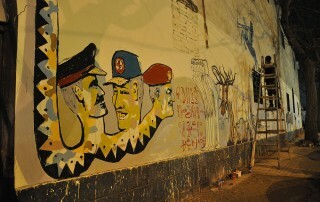 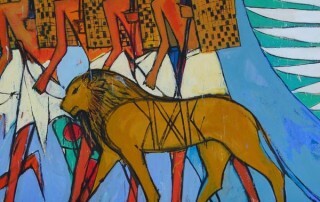 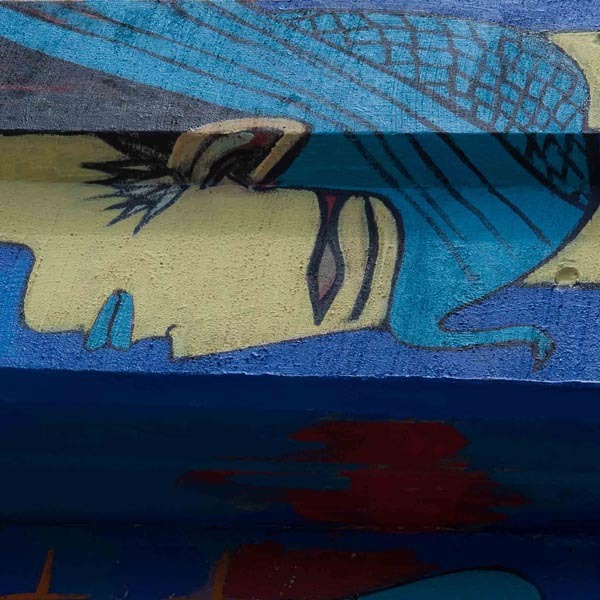 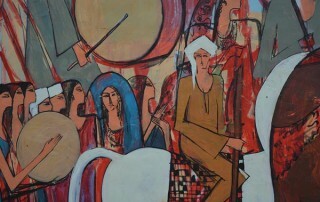 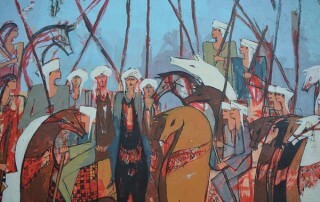 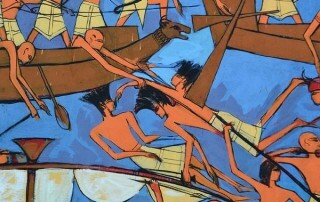 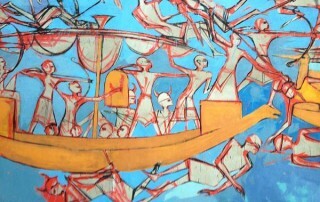 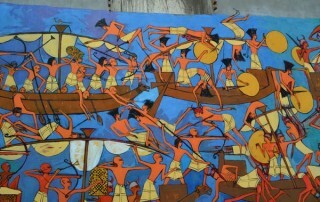 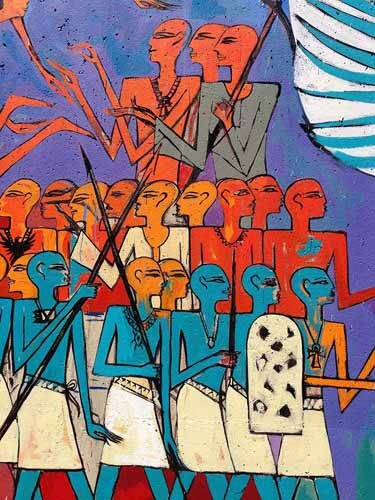 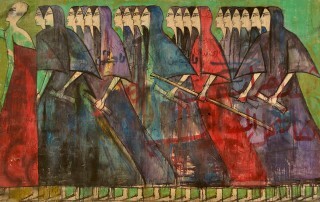 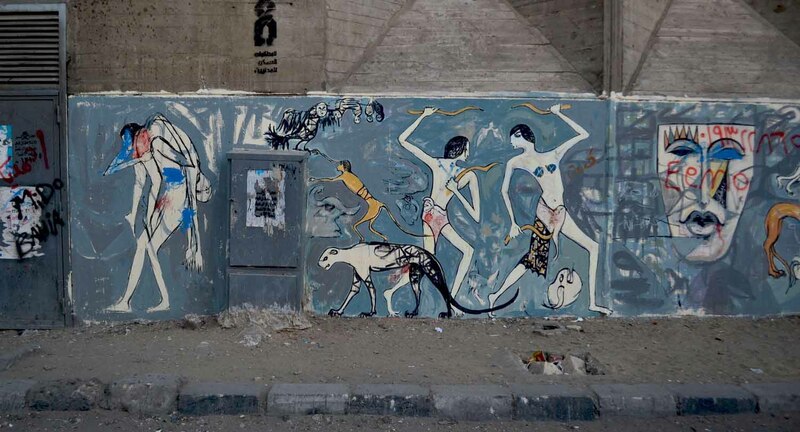 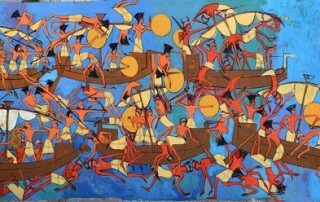 Beyond the aforementioned unique style of painting, using a neo-pharonic style aims to return the prominence of graffiti in Egypt. 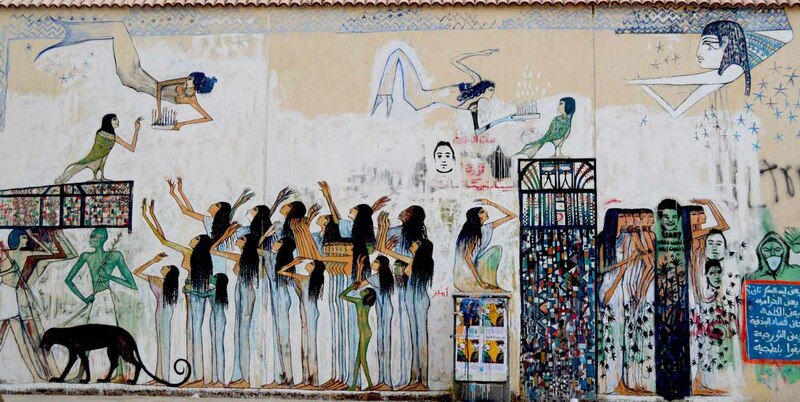 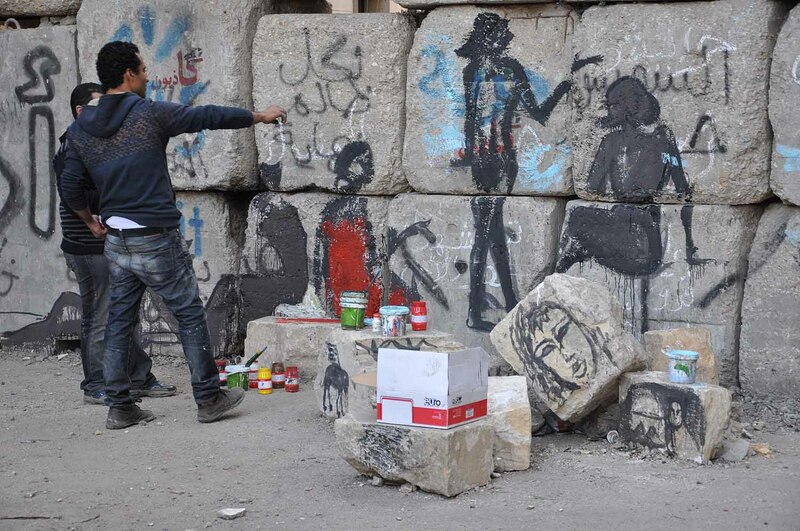 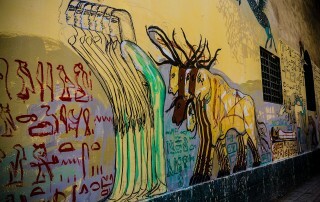 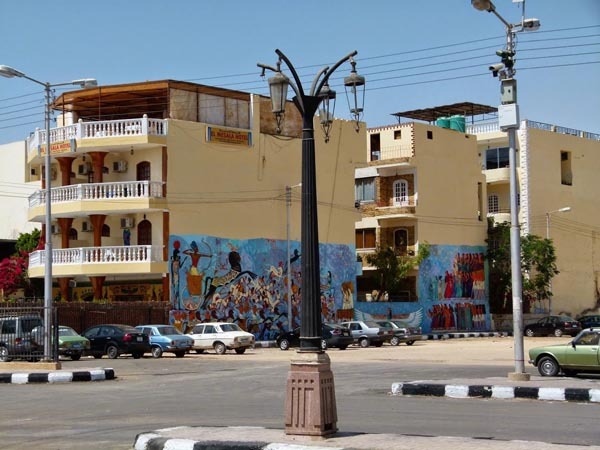 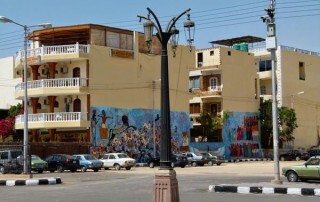 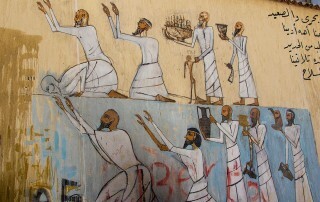 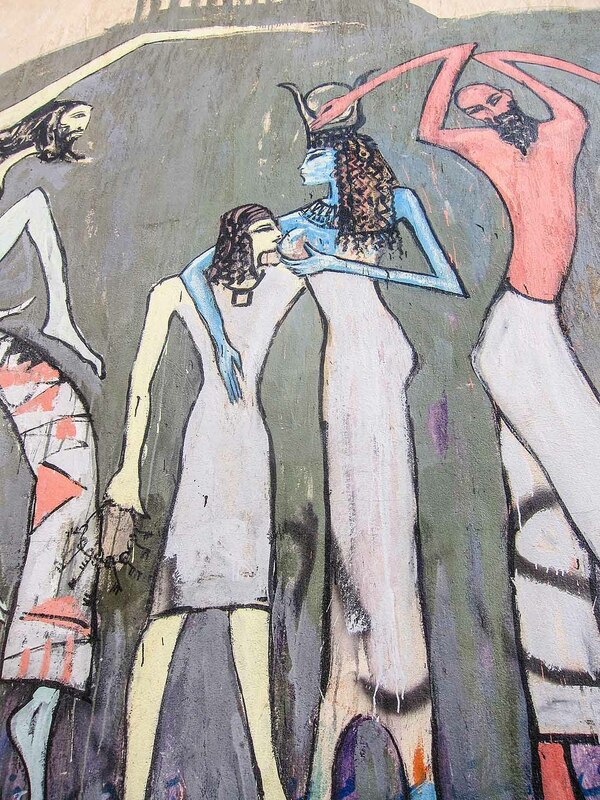 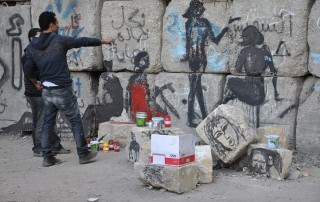 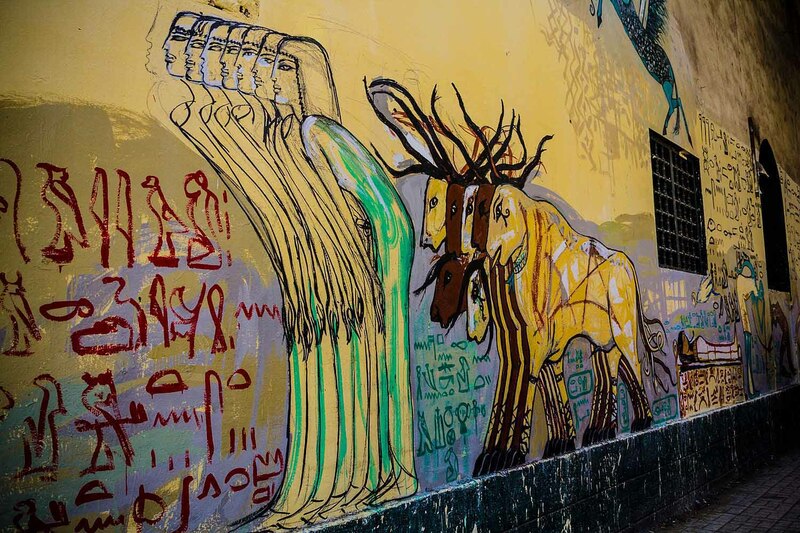 Graffiti has played a significant role in Egyptian villages in the past, when each village had their own graffiti artist. 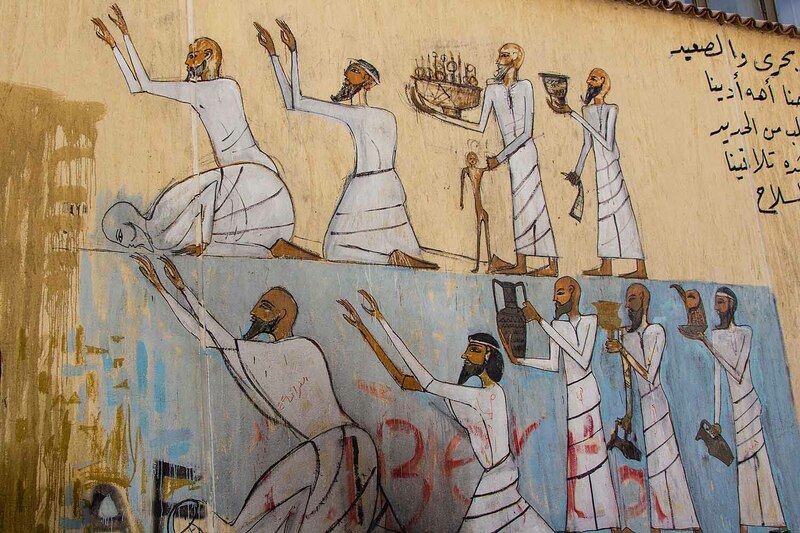 These graffiti artists would essentially be storytellers of the village and would depict important events or celebrations through traditional imagery and symbolism. 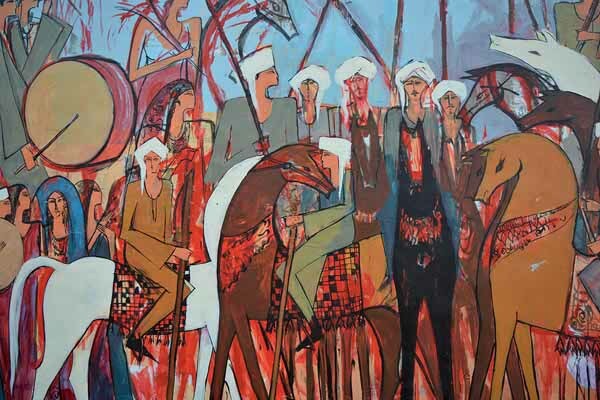 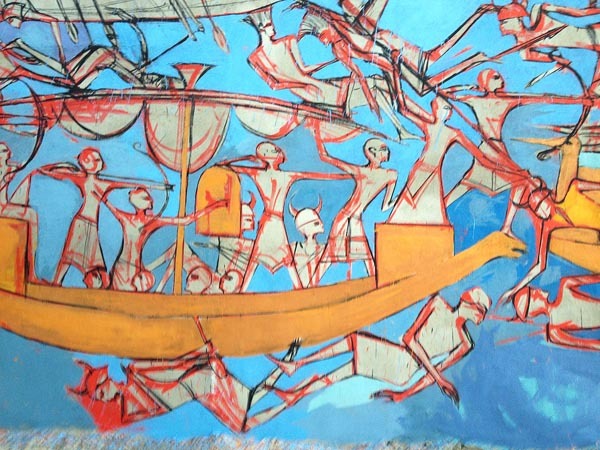 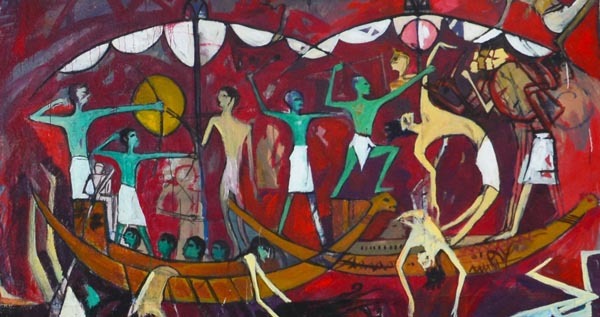 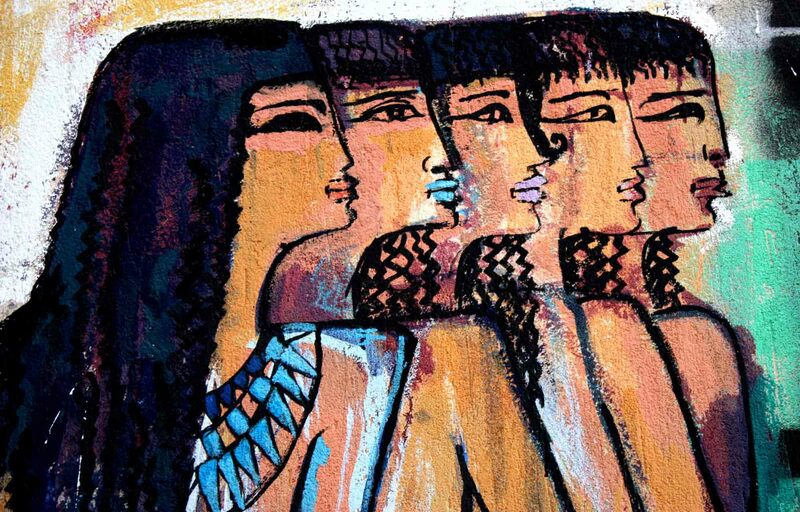 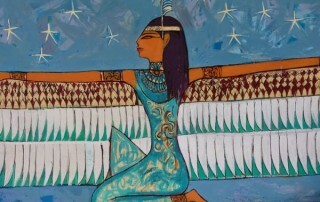 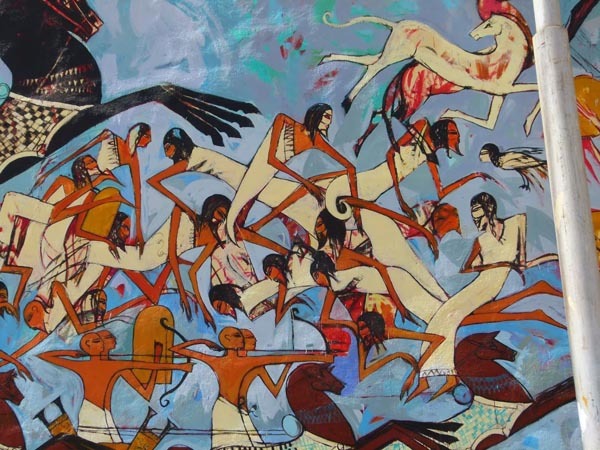 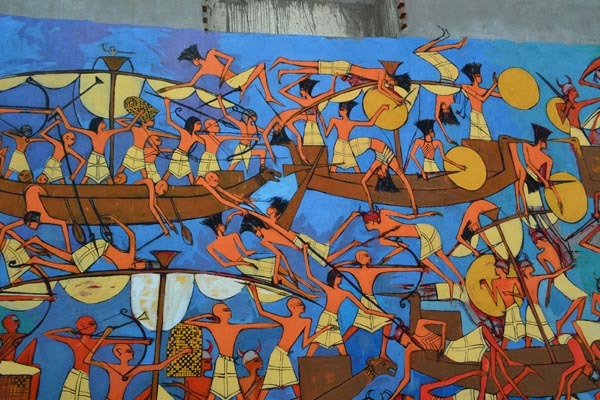 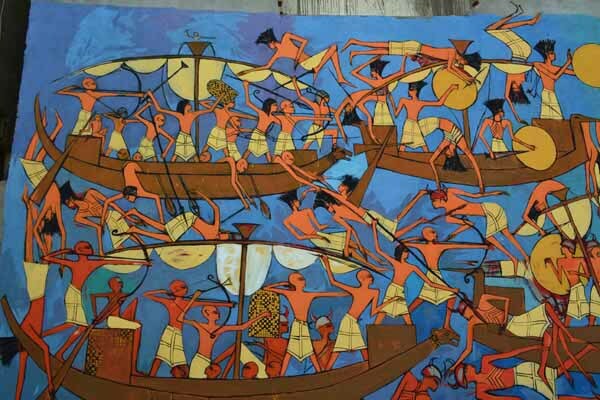 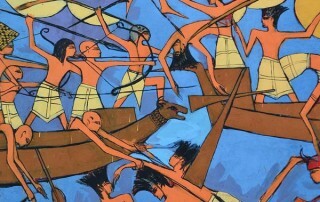 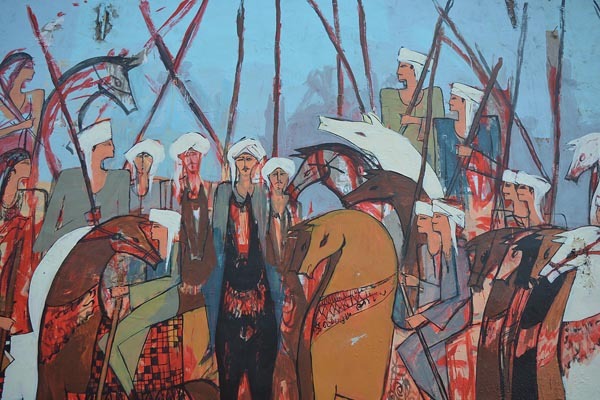 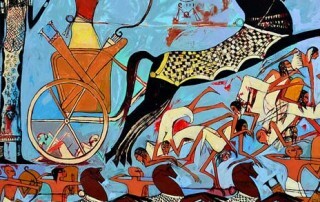 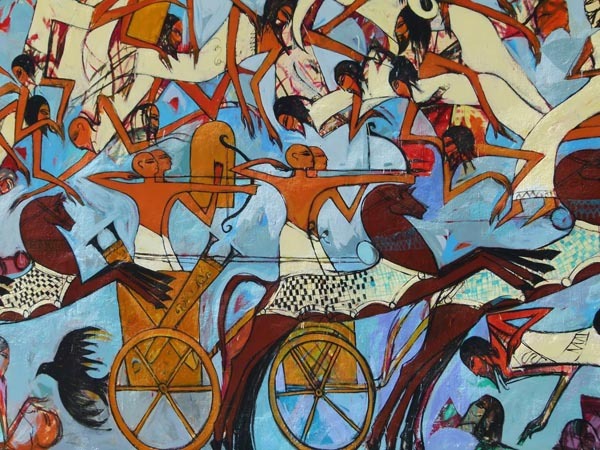 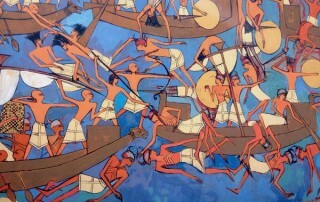 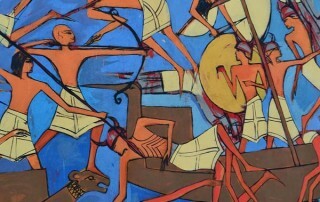 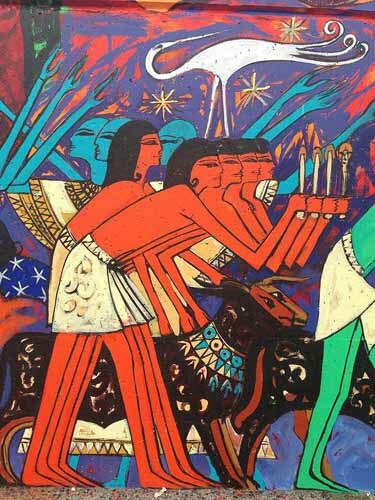 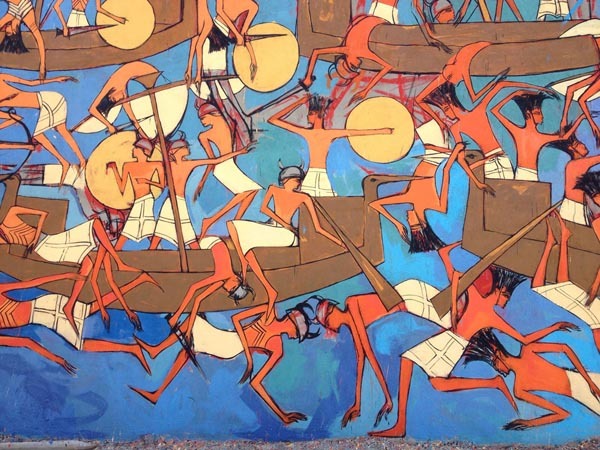 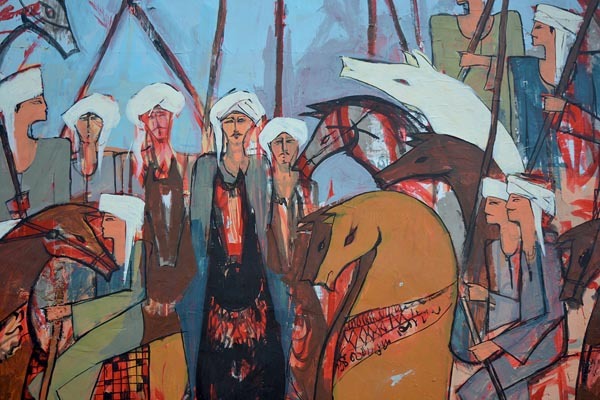 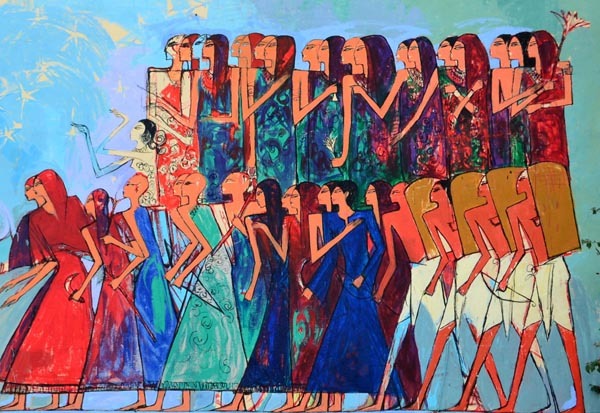 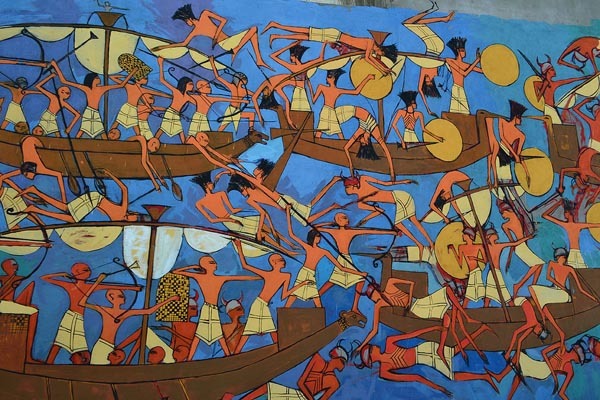 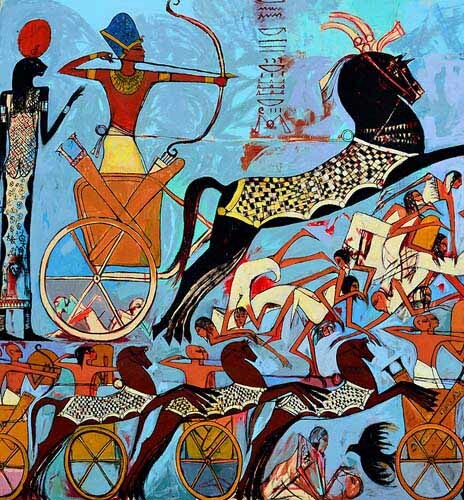 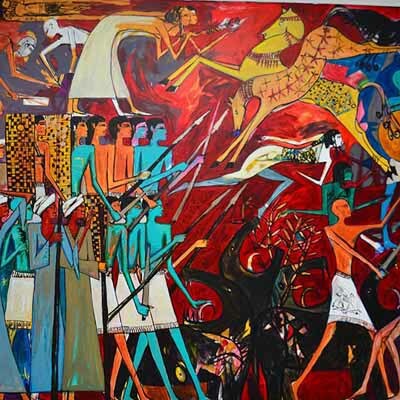 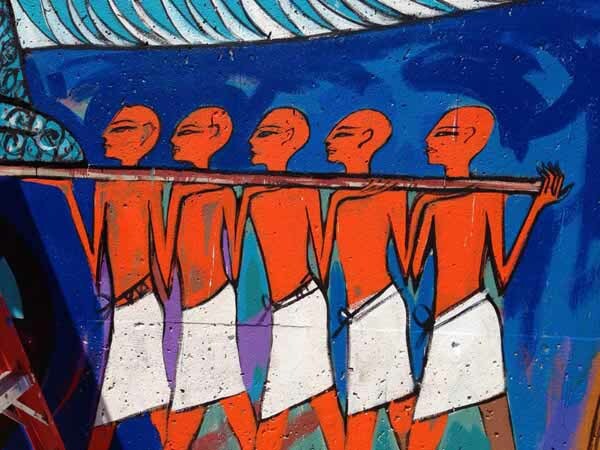 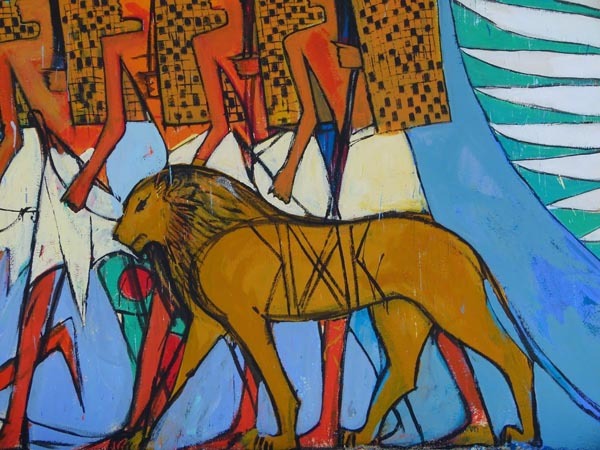 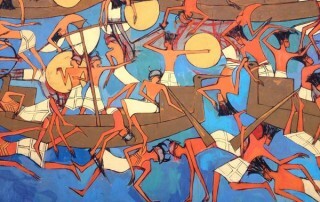 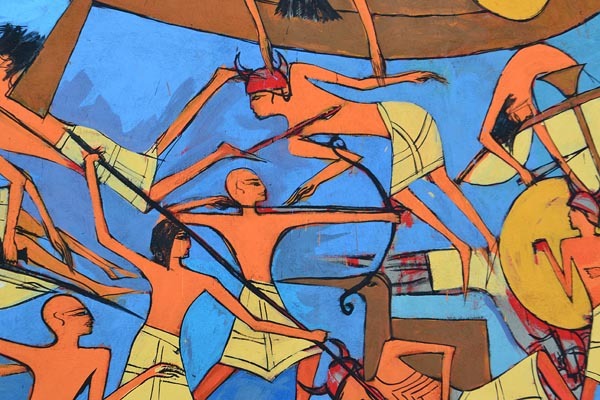 Many of these same images can be seen in Awad’s artwork today as he bases his works off of famous works of art from Ancient Egypt that may be seen in temples and museums. 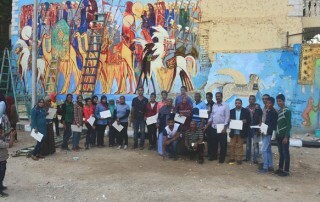 This Mural workshop was an extension of the mural from 2015. 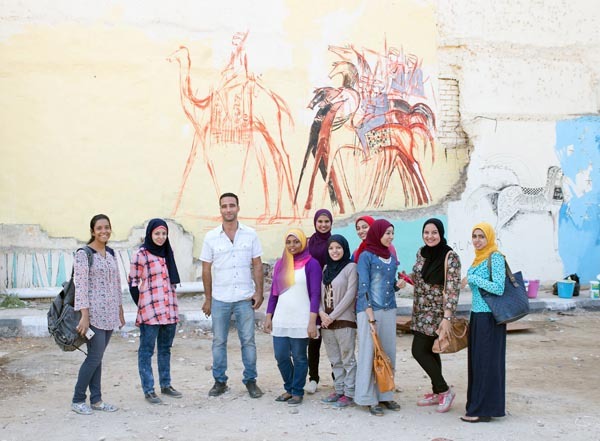 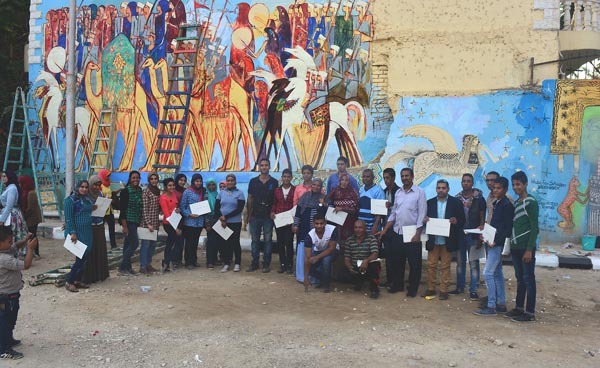 The workshop was conducted with the independent youth and students from the Faculty of Fine Arts, South Valley University in Luxor, Egypt. 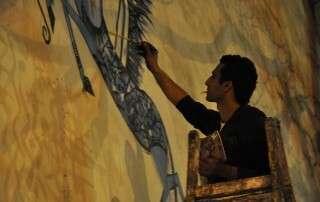 Supported by Egyptian Ministry of Youth. 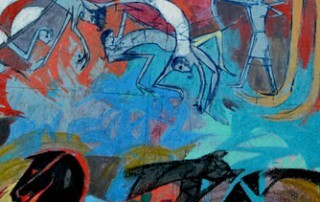 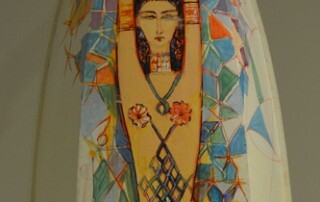 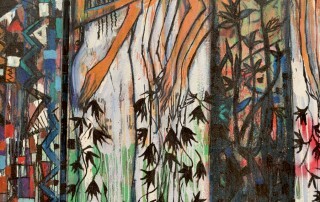 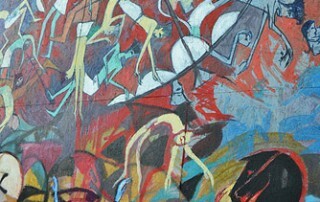 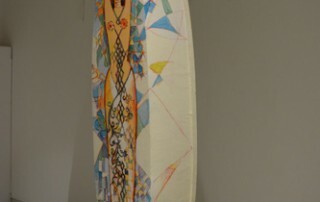 In North Adams – USA for the gallery MCLA and Down Street Art was created for long wall paintings. 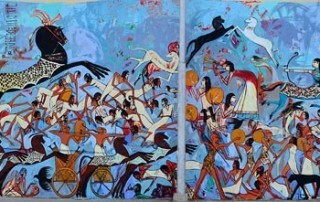 It shows in the middle the egyptian goddess of justice ʺMa’atʺ, to left side the fight for the justice and on the right their homage. 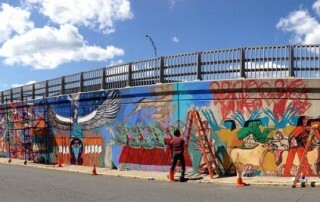 It is on Center Street in North Adams. 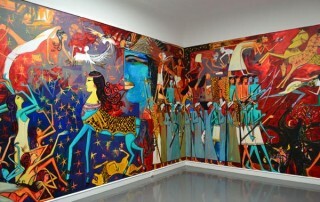 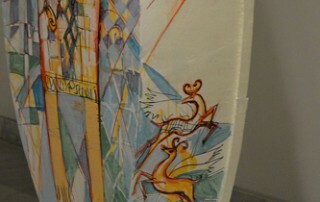 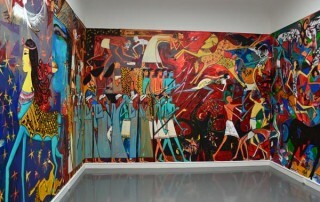 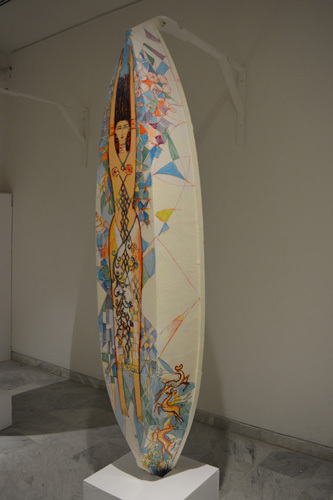 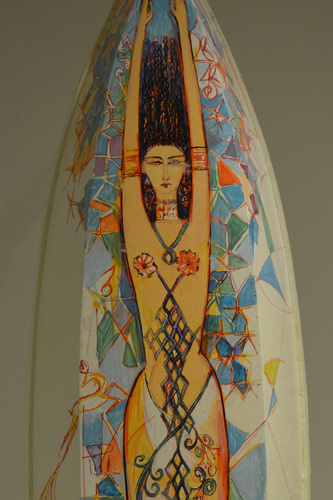 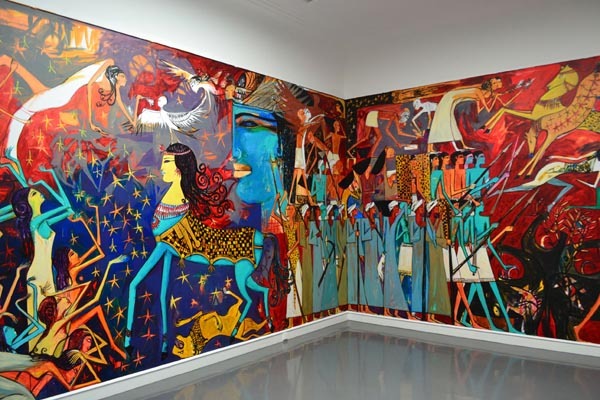 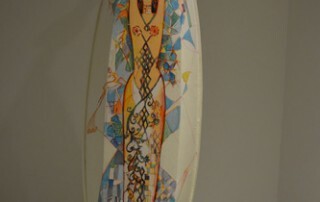 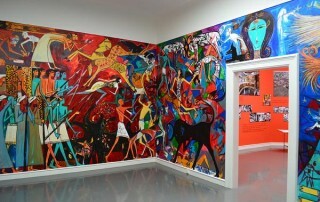 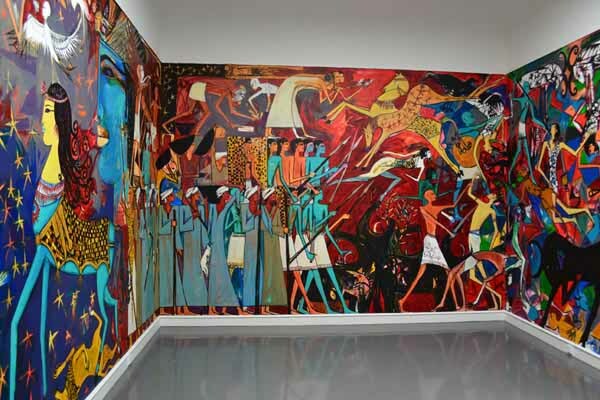 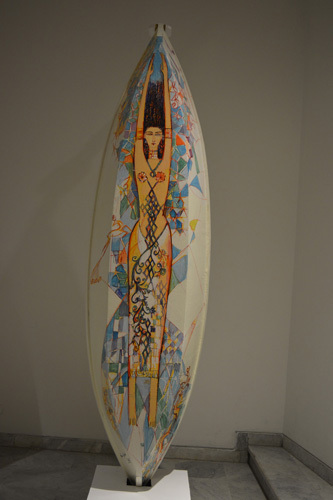 The mural, as well as the gallery opening, mark Awad’s first exhibition and commissioned mural in the United States. 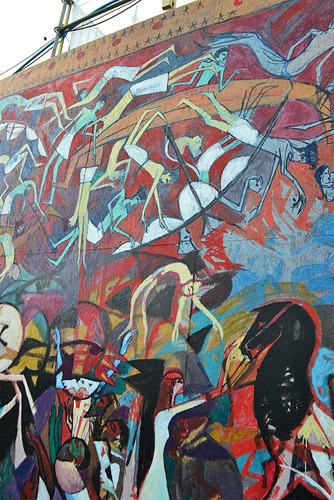 Cache (2013), acrylic on wall. 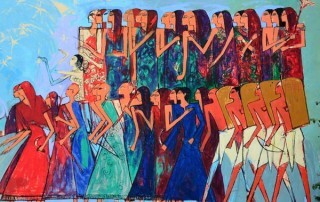 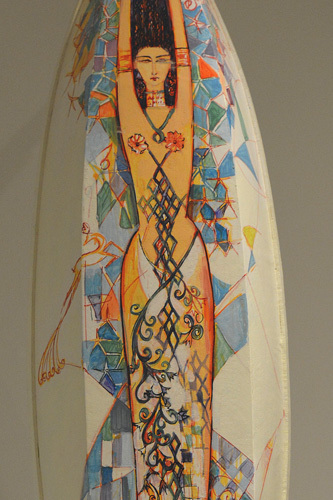 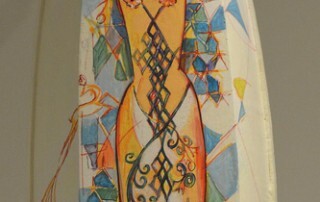 An expression of the society of Egypt, inspired by the heritage and culture of Ancient Egypt and modern life. 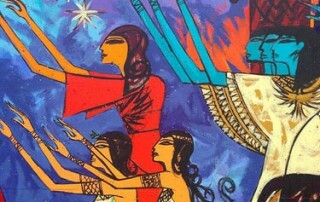 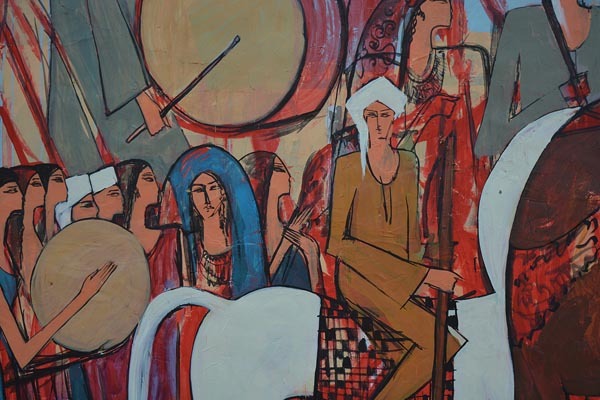 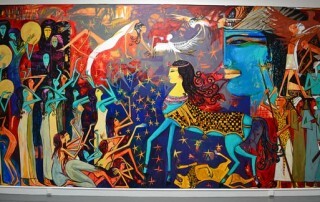 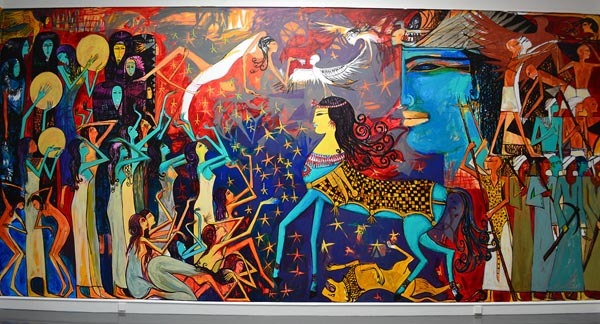 Depicts the women and Buraq of Sufi culture (horse with the face of a woman). 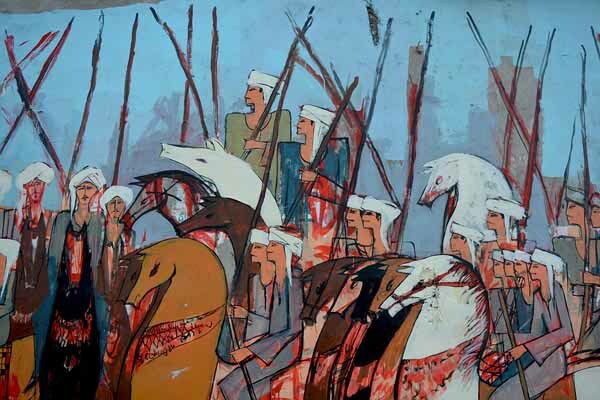 People wait for a leader (the large portrait of a man), then workers, farmers and soldiers fight Terrorism. 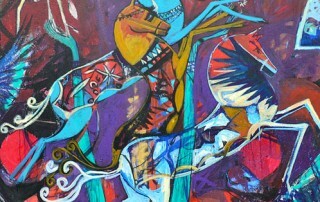 artists from Africa, Latin America, the Middle East and Asia. 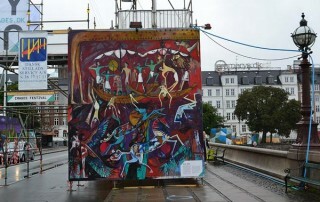 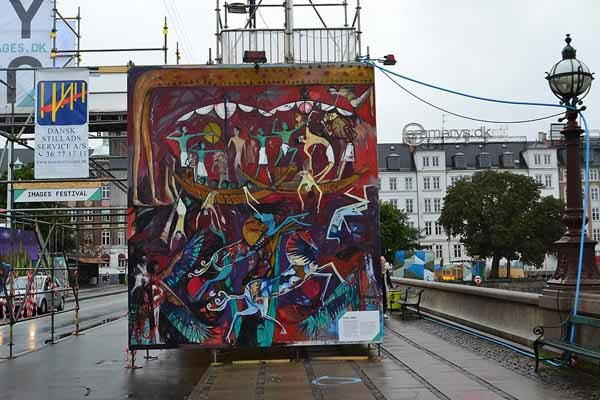 The IMAGES Festival is Scandinavia’s largest contemporary international arts and culture festival.